I love Great Britain. Mark and I were married in Duns, Scotland (four years ago to the day tomorrow!) after running around Edinburgh for a few days and then honeymooned in London (as well as Amsterdam). I didn’t expect to love London as much as I did, but I fell completely in love with it and have returned several times since. Ninety percent of the un-animated television shows that I watch are British. I read a lot of British books (particularly Scottish, actually, for some reason). A good deal of the music I listen to is British. I pretty much consider myself an honorary Brit. One thing I do not love about Britain, however, is the cuisine! Although I’d venture to say it’s actually even easier to be vegan in Britain, at least in the larger cities, traditional British food is quite frightening. Blood pudding, anyone? One British meal I can deal with, though, is cauliflower cheese, which is essentially macaroni & cheese using cauliflower instead of pasta. Now, how bad can that be? 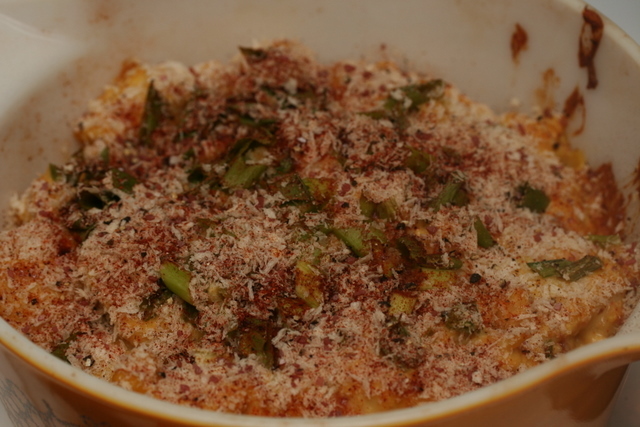 I purchased a huge cauliflower at Wegmans the other night, and what with my mind being even more on GB than usual with my anniversary tomorrow, I decided to make my ode to non-disgusting British food: vegan cauliflower cheese! 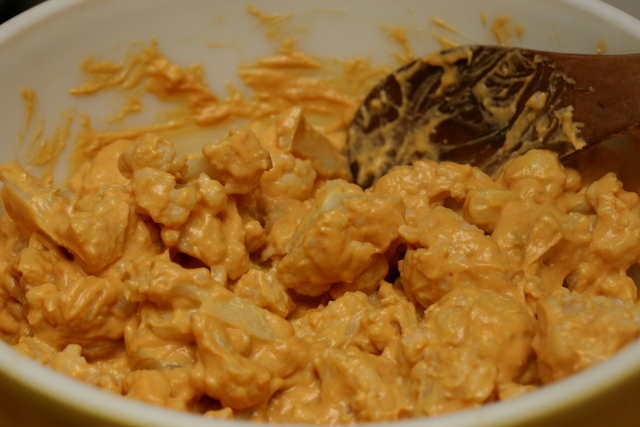 I’m going to continue to tinker with the “cheese” sauce recipe, which was based on the Pimiento Cheez recipe from Simply Heavenly!, but here’s what I have so far. Preheat the oven to 350 degrees Fahrenheit. 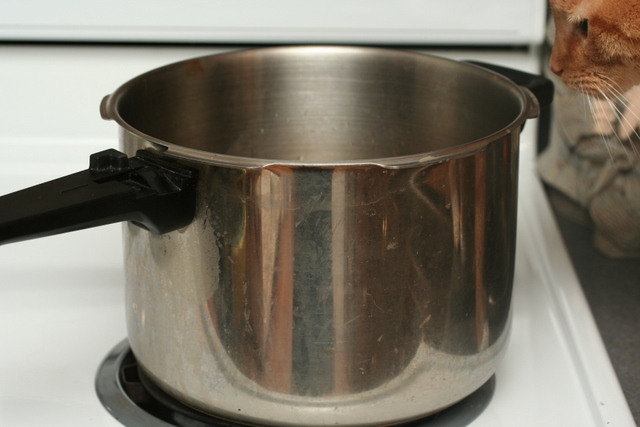 Bring a large pot of water to a boil, salting it if you’d like. Meanwhile, chop the cauliflower into florets. 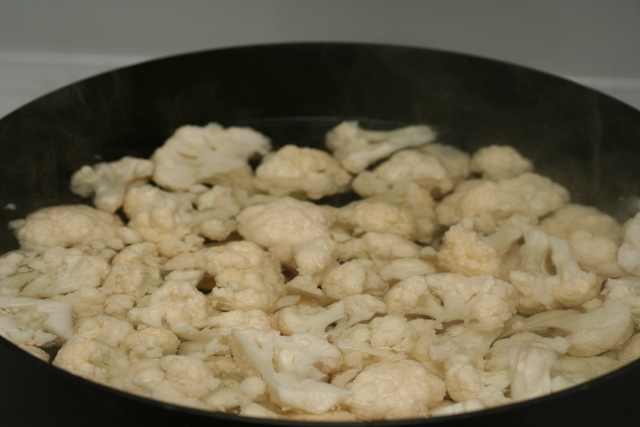 When the water comes to a boil, add the cauliflower and cook for 8 minutes or until just tender. 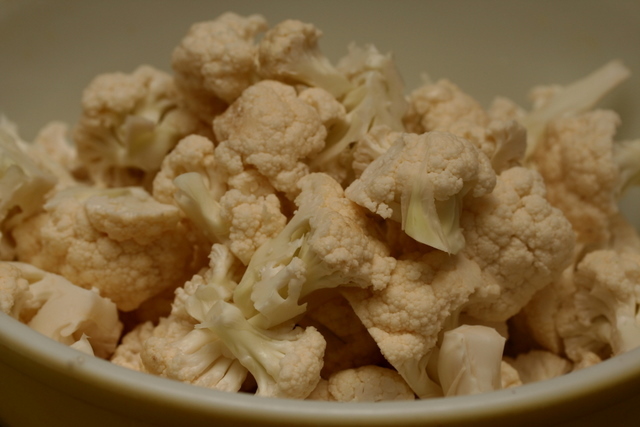 Drain the cauliflower and set aside. 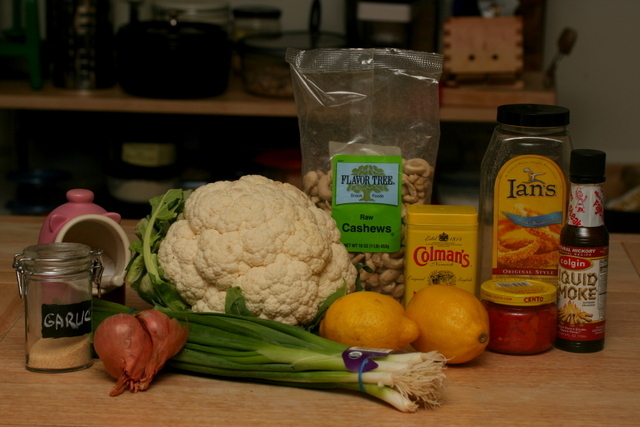 Combine the cashews, 1 cup of water (you can use cauliflower cooking water to regain some of the nutrients lost to cooking! 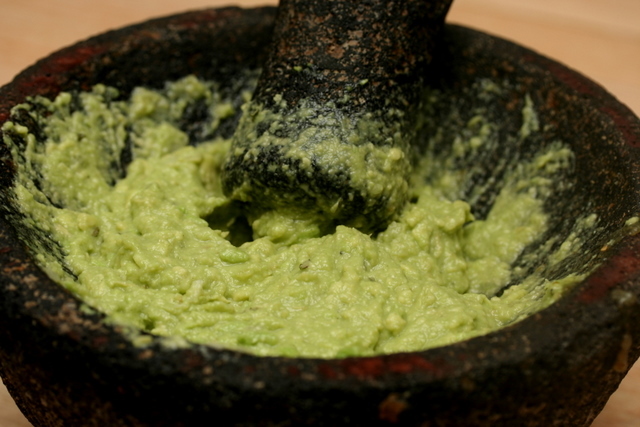 ), nutritional yeast, shallot, pimientos, mustard, salt, garlic powder, lemon juice, and liquid smoke in a powerful blender or food processor and blend until smooth. 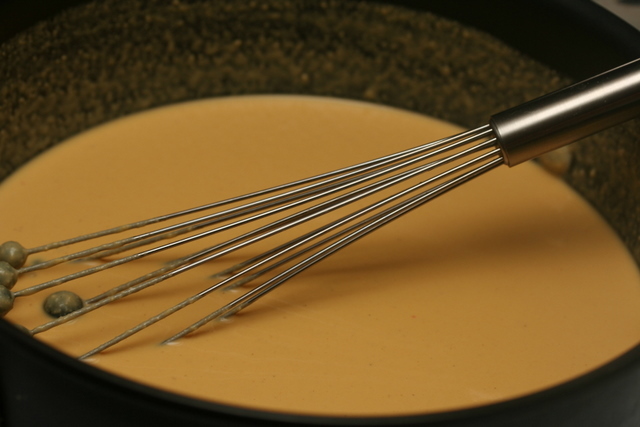 Heat the olive oil in a heavy-bottomed pot, then add the flour and whisk into a dry roux. 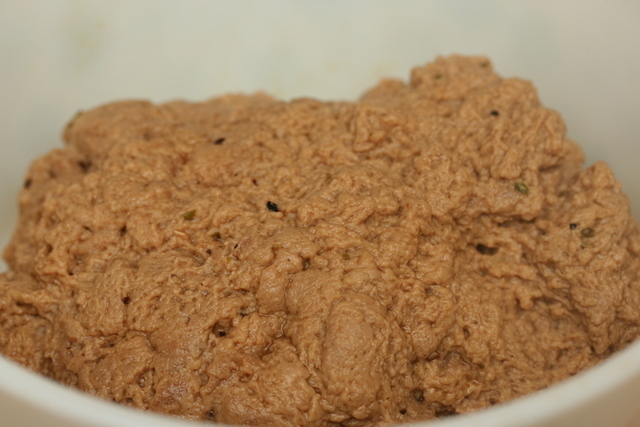 Heat over medium heat until thickened. 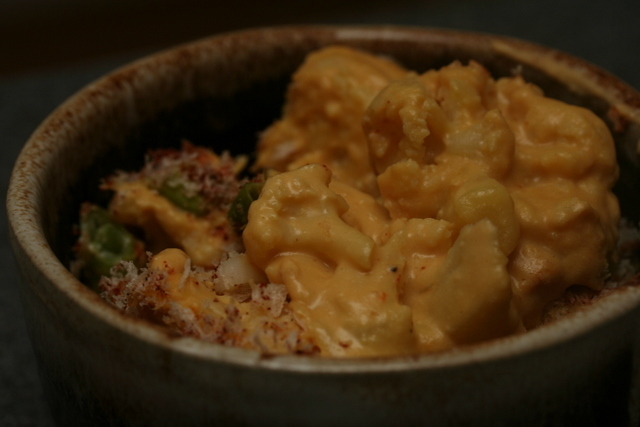 In a large bowl, toss the cauliflower with the “cheese” sauce. 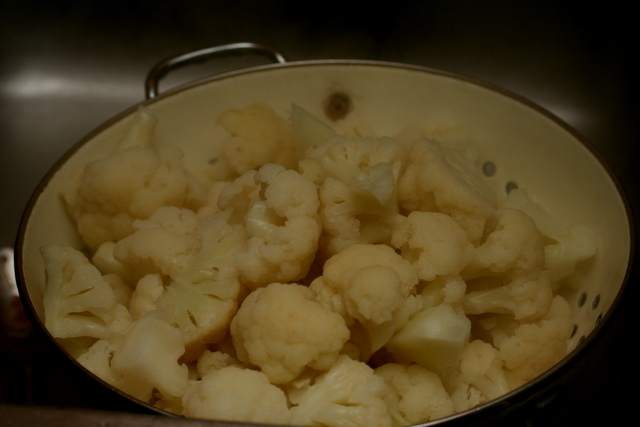 I didn’t use quite all of the sauce; how much you use will depend on how large your cauliflower was and how “cheesy” you want your dish. 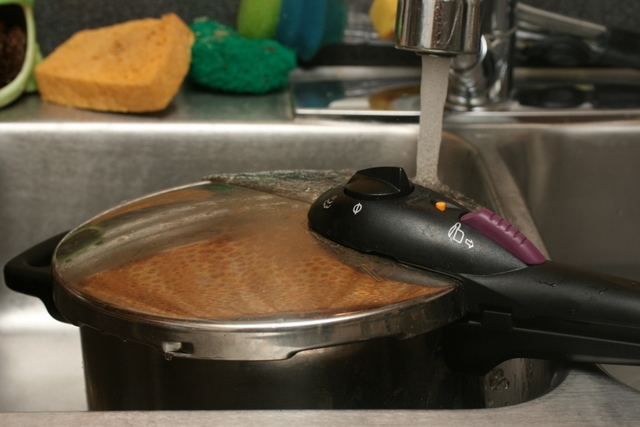 Transfer to a baking dish. 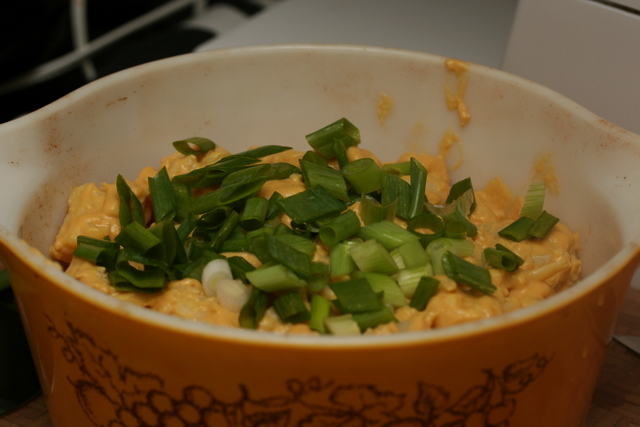 Top with scallions if desired. Honestly, I think I’m gonna skip the scallions next time. 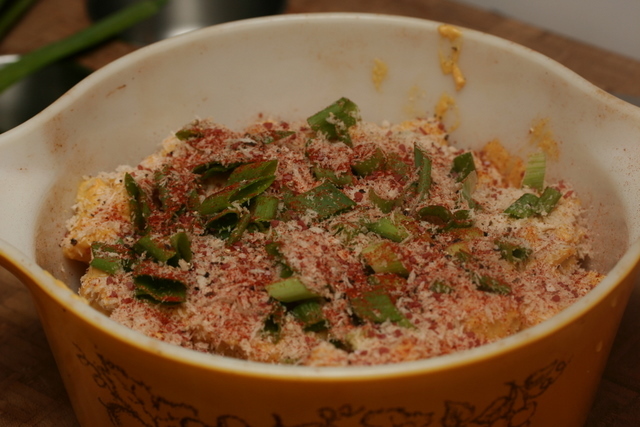 Top with the breadcrumbs and, if you’d like, sprinkle with paprika. I also sprinkled with Hawaiian red salt. Cover and bake for 25 minutes or until bubbly. Serve. I made a tossed salad for the side; I understand peas are a good accompaniment. On an unrelated note, I booked my flight to Sydney today and I am SUPER excited about it!!! If any of you from “down under” want to start sending recommendations my way, please do! 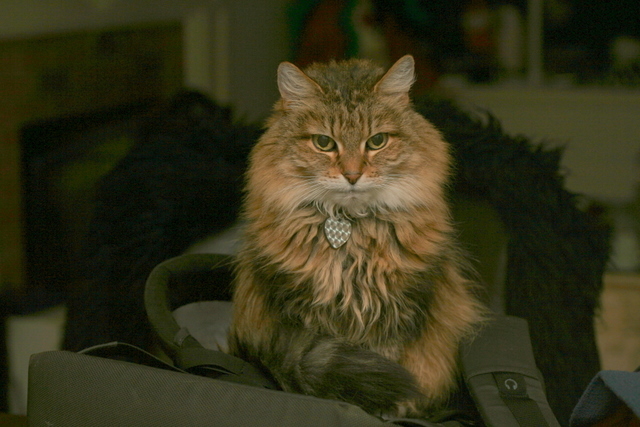 I have until February 20th to get the vegan scoop on Sydney. I can’t wait! I hate Northern Virginia for many reasons, not the least of which is the traffic, the horrible traffic. Unless you live, like me, in the DC metro area, or in Los Angeles, you probably don’t understand traffic. Listen: my office is less than 10 miles from my home and it regularly takes me an hour to go from one to the other. The other morning I had an appointment 2.5 miles away and it took me 45 minutes to get there, and that is no exaggeration. It’s OBNOXIOUS. Tonight it took me nearly two hours to get home. Now, that did include a brief stint in a grocery store, but that accounted for 15 minutes, tops. I had an idea for dinner tonight that required raw cashews, a commodity I can’t keep at the house. Mark eats them. 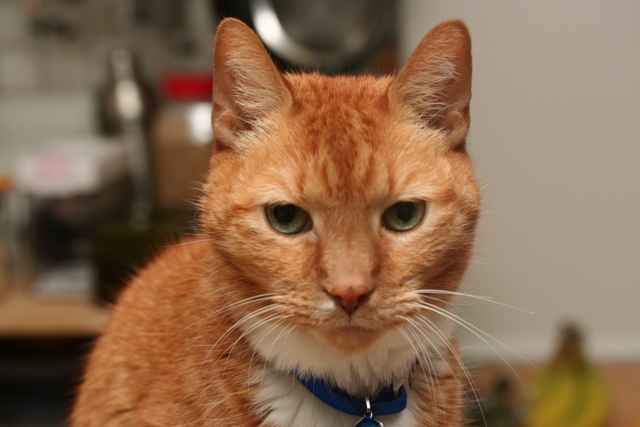 He seeks them out and consumes them with a frightening ferocity. He will destroy the kitchen in search of them if he suspects I’m hiding them. So if I need ’em, I’ve got to buy ’em that day. 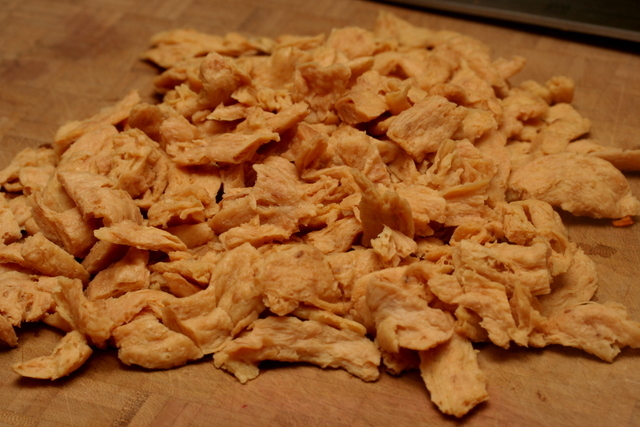 I decided, then, to take an alternate route home from work that would pass by a Whole Foods, where I could quickly pop in, pour a pound or two of cashews out from the bulk bin, and pop back out. Bad mistake. Little did I know the town that is home to that particular Whole Foods was hosting a Halloween parade, shutting down their entire main street – the location of Whole Foods – drag. I was therefore detoured into a suburban neighborhood ill-equipped to deal with large volumes of traffic; me and a million other cars driven by people anxious to get home. Or to Whole Foods. Another reason I hate Northern Virginia is the roads make no sense. None. I come from Baltimore, which is laid out as a lovely grid. You give me an address and a street and I can tell you how many blocks and in which direction it is from the center of the city, even if I’ve never been there. Baltimore makes sense. DC and its disturbing cousin Northern Virginia make no sense. I’ve been here for five years now and I can find my way to the important places (read: grocery stores and the 9:30 Club), but if I so much as stray one block from a regular route, I’m a goner. And our portable GPS was in Mark’s car following our Charleston trip, so I was bereft of any electronic assistance. After sitting at a light for 4 cycles without moving, I made a right turn into a neighborhood, convinced it had to end up somewhere that I’d recognize. After driving through suburban hell for 15 minutes, I did eventually emerge in a recognizable land: 10 miles further out than I started, past my office. 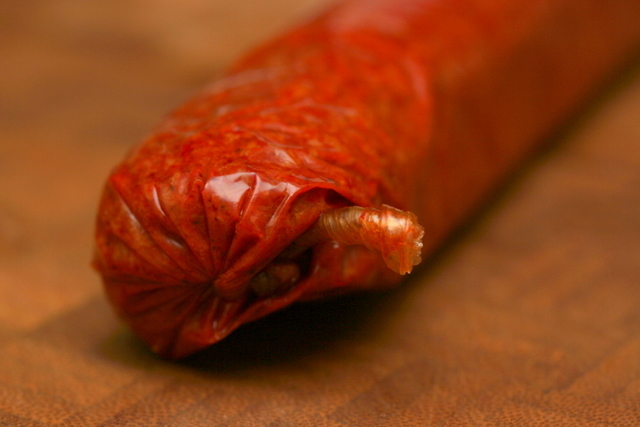 The upshot of this tale is I did go to Whole Foods: just not the one I’d intended. I stopped at the Whole Foods just a couple of miles down the street from my office…an hour after I’d left it! I got my cashews, but decided I was too tired and annoyed to make dinner at this point, so I looked to see what they had ready-made for me. Which leads me to why, for all of the seething hatred I often feel for Northern Virginia, I sometimes love it. 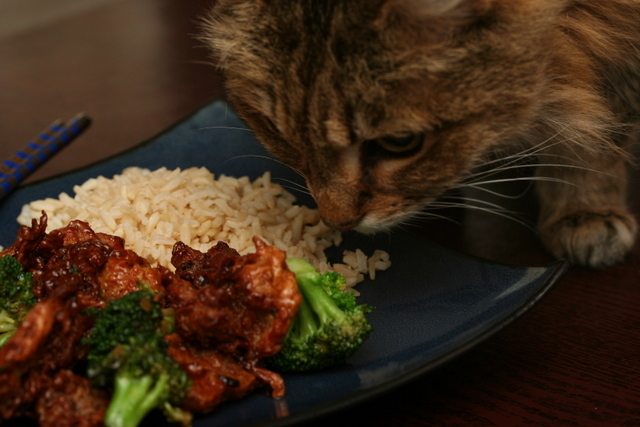 Whole Foods had freshly-made vegan General Tso’s chicken available for my dining pleasure. I’m sure no one in my beloved San Francisco is too impressed by this, but there aren’t that many other places where a vegan can stop by a grocery store and pick up an instant dinner with such ease. Sure, I may not have needed the instant dinner if I lived elsewhere (feel my pain, Capt. Yossarian? ), but boy, have I grown accustomed to it. It’s actually dangerous. I have, on more than one occasion, read a label on the hot bar at Whole Foods (for example) that clearly said “chicken” and assumed it was vegan. 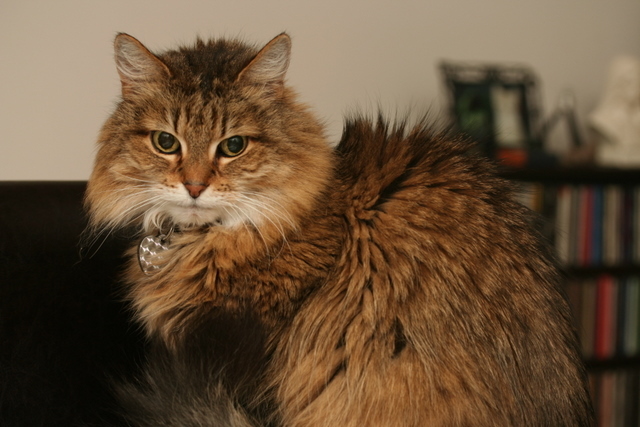 I am so spoiled that, rather than automatically assuming I can’t eat things, as I used to do, I assume I can. I have the freedom here to forget I’m a weirdo! (I must tell you that I feel much, much less like a weirdo in San Francisco. Although I can eat with ease here, I fit in a million times more right in San Francisco.) Every time I want to move away from Northern Virginia, I remember that my house is not only half a mile from glorious Wegmans, but cradled between THREE Whole Foods, two Trader Joe’s, Super H, and a myriad of ethnic grocery stores of every imaginable type. The grocery scene is sublime. I had leftover rice from dinner last night, so, utilizing a microwave, I had a pretty good dinner ready in under two minutes. 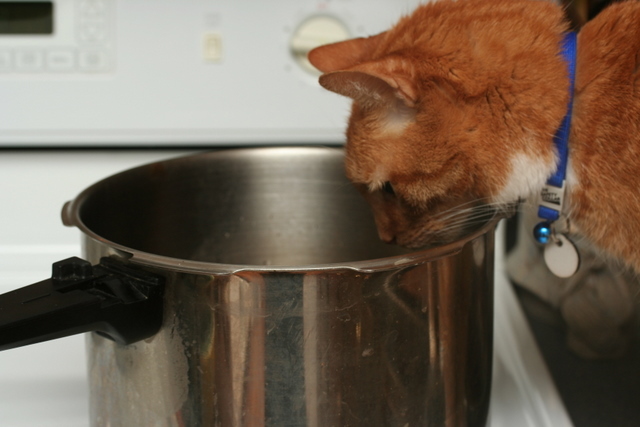 Well, I’m sorry for not having a recipe tonight. I had actually intended to, but sometimes life in Northern Virginia just gets in the way. 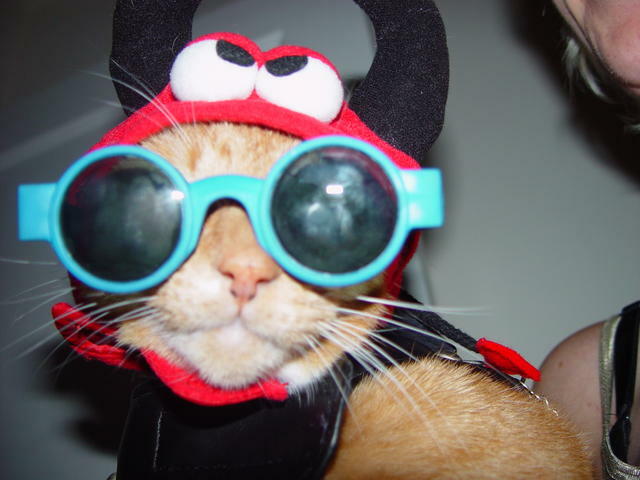 I actually softened a bit, I must admit, when I realized the traffic issue tonight was caused by a Halloween parade. I love Halloween so much I was married on it, so it’s hard to hold a grudge against a town for celebrating my favorite holiday. Hello? Have you missed me? Sorry it’s been so long since I’ve posted. First it was my birthday, then Mark’s birthday, a visit to Mark’s family in Charleston…I’ve been very busy! And next up is our wedding anniversary! October is full of wonderful events, but they’ve all been keeping me out of the kitchen. Tonight I finally got to cook something decent. 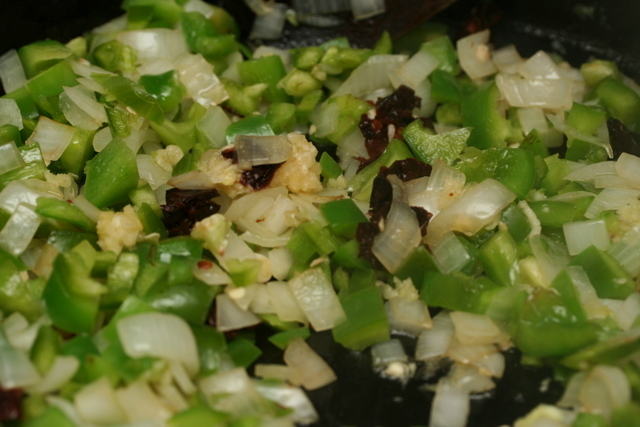 While the rice is cooking, prepare the veggies, etc. 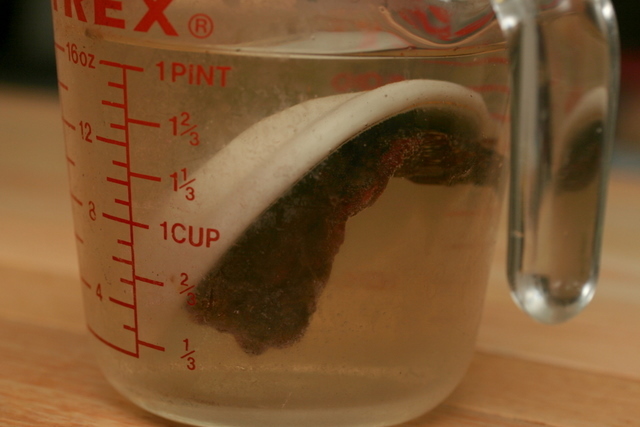 Rehydrate the pasilla oaxaca in boiling water. I had to stick a tiny saucer on top of the chile to keep it from floating. 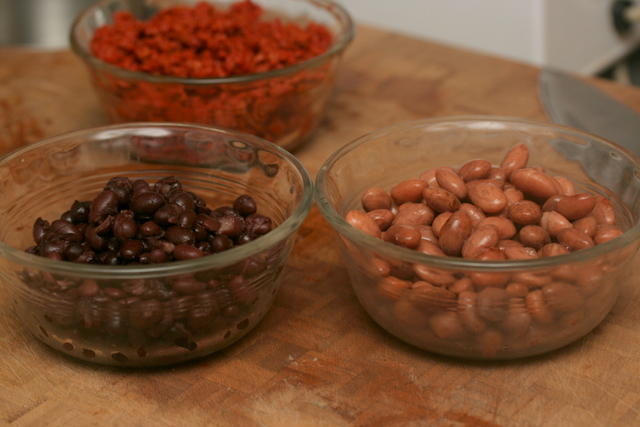 Rinse the beans. Instead of using half a can of each kind, you can use an entire can of one or the other. I couldn’t decide which I wanted, but now I’m stuck having to find another use for the leftovers! 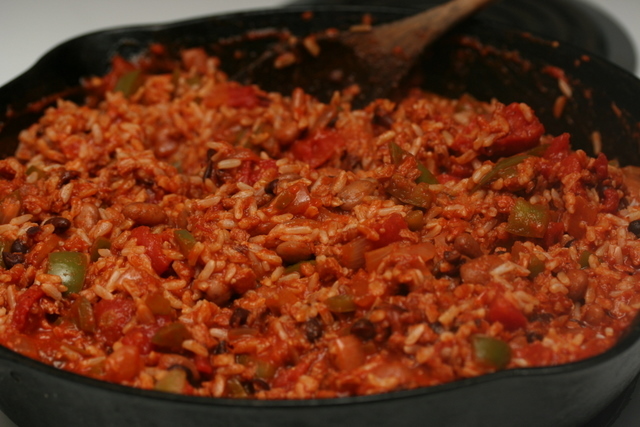 Allow to simmer for about 5 minutes, then add the rice and heat through. Finally I added the juice of half a lime and some cilantro. … which makes for an anti-climatic photo, but which was pretty darn tasty. 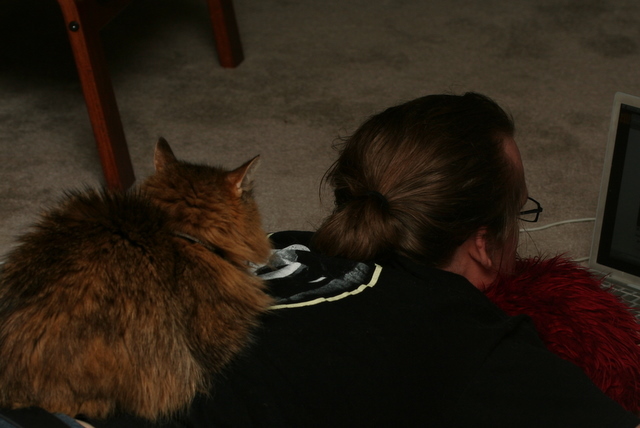 … until Tigger decided he wanted to sit there. 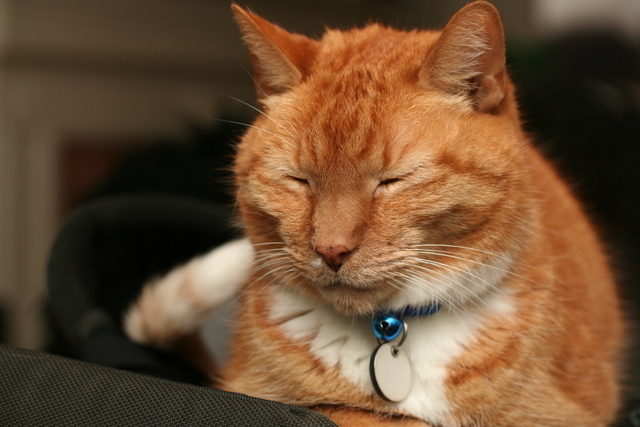 Then Tigger got in my face. 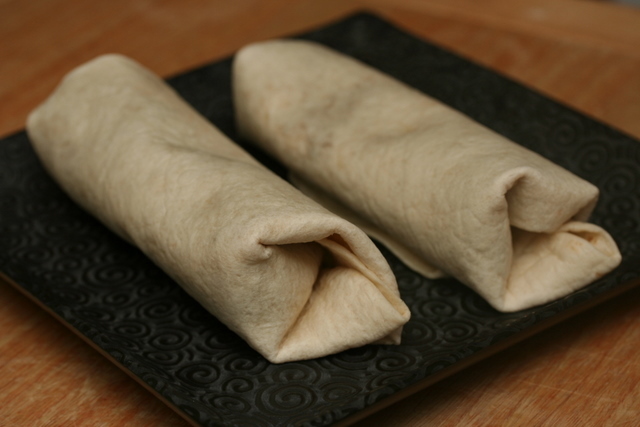 And I finished my burritos. The end. I’m afraid I don’t have a recipe tonight, but I thought I’d drop in, say hello, and post a couple of pictures. My birthday was yesterday, so I baked myself a cake. You may have noticed I don’t make many desserts, so my cake baking – and decorating – skills are mediocre at best. It’s a little unintentionally Rocky Horror Picture Show. Mark gets to share the cake with me because his birthday is Friday! 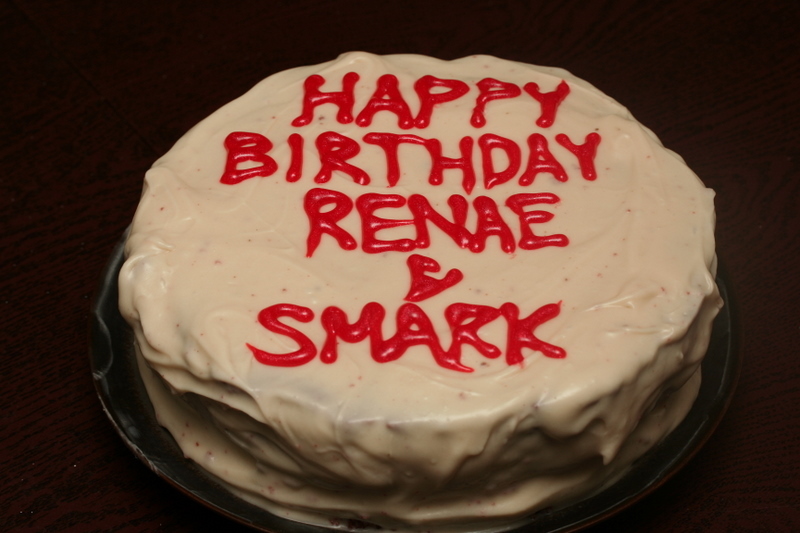 Plus there was a lot of room left over on the cake after I got to Renae…. It’s a red velvet cake with Tofutti cream cheese icing, and it’s not that great because I overbaked it. And red food coloring proving strangely hard to come by in Northern Virginia, it may more aptly be termed a mauve velvet cake. Oh well. I also made pumpkin muffins and those were very good. Mark got me the BEST PRESENT EVER! It’s not food related, but it’s so great I have to share! The Oxford English Dictionary! Now I’ll know every word in the language! And Fortinbras got me a special bookshelf to house it. It’s really, really nice. 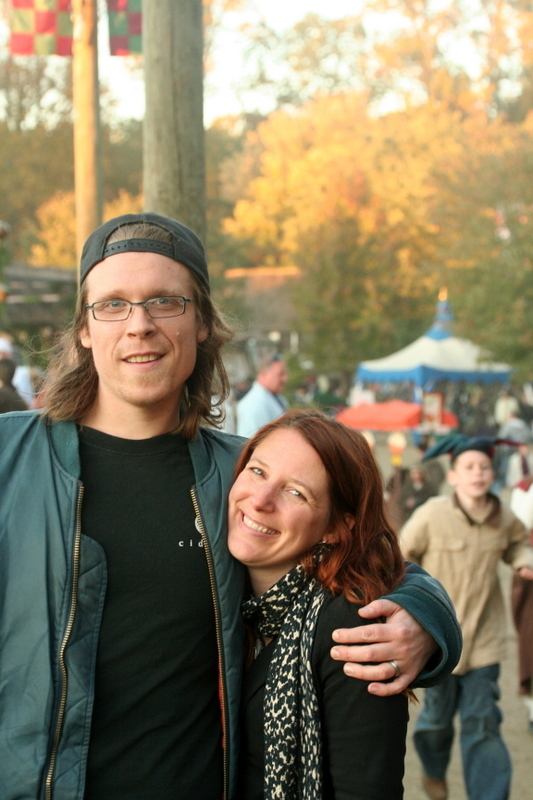 To celebrate my birthday, some friends and I went to the Maryland Renaissance Festival. Renae and Renaissance are different forms of the same French word, meaning reborn and rebirth respectively, so I like to claim ownership of the RenFest. The Renaissance Festival is not exactly burgeoning with vegan – or even remotely healthy – food, though. My friends seemed determined to eat the most ludicrous foods they could get their hands on, including deep-fried macaroni and cheese on a stick (I kid you not). For dessert they had a deep-fried Twinkee and a couple of deep-fried Oreos. It was truly astonishing. I took a lot of pictures, but trust me, you don’t want to see them. I did eat some curly fries, however. It was my birthday. I can have curly fries on my birthday. My friend Melissa has been talking about this vegetarian restaurant up in Clarksville, Maryland for months, and as it wasn’t too terribly far from the RenFest she suggested we go there for dinner. Great Sage was really great! Nearly everything on the menu was vegan and it was all very delicious. The staff graciously tolerated our antics and even gave me a free drink. And I just noticed their lunch menu has a tempeh reuben, so methinks we’ll have to make it up there for lunch sometime! The weather finally turned cool this weekend. 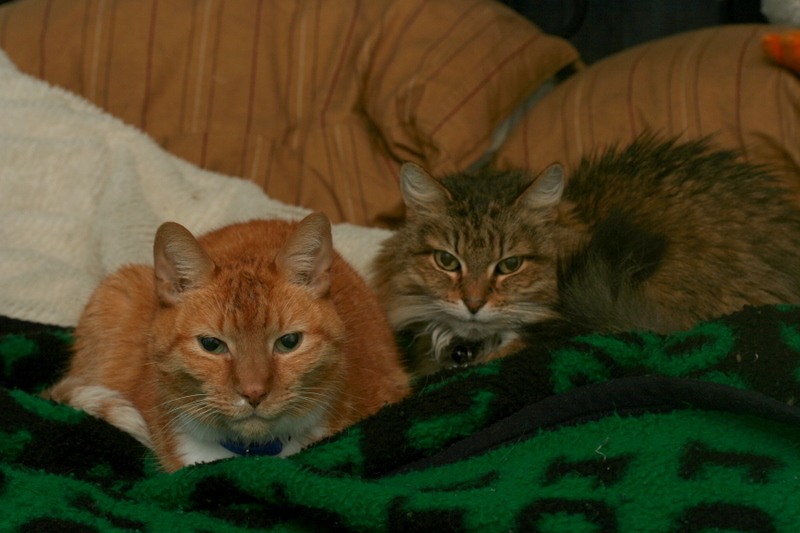 Brachtune likes it when it gets cold because Tigger will tolerate her presence in exchange for body heat. It’s pretty rare they get this close! That’s it for tonight…I’ll try to muster up a real post tomorrow! Bryanna posted a recipe for Kadu bouranee, everyone’s favorite Afghani appetizer, yesterday, and I had a pie pumpkin sitting around that was begging to be used in something I’ve never made before, so I decided we were having Afghani food for dinner tonight. Bryanna said she ate it as an entree, but kadu bouranee is too sweet to be more than an appetizer in my opinion so I needed to find an entree. 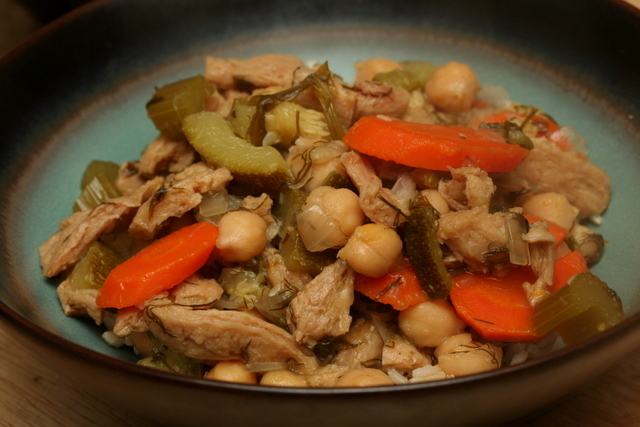 After searching the internet for vegetarian Afghani meals, I gave up and veganized a chicken dish instead. (I don’t know why I couldn’t find anything appealing, because there are plenty of vegetarian dishes at The Helmand in Baltimore.) 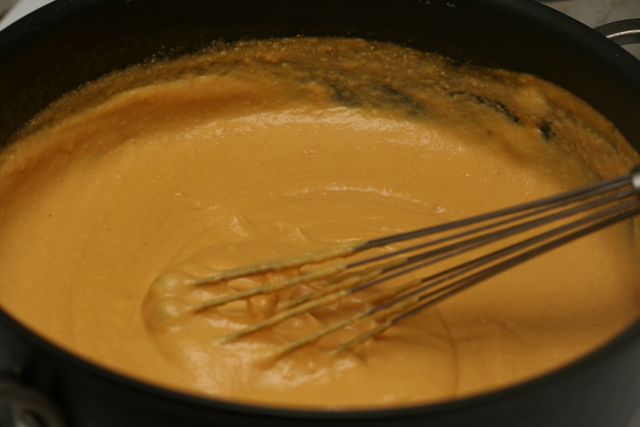 This recipe from recipes.wikia.com is what I worked from. 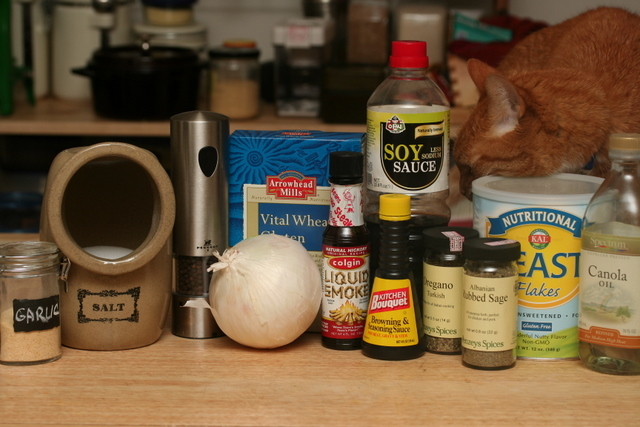 I took the ingredients photo before I realized I didn’t have any chickpeas in the house. 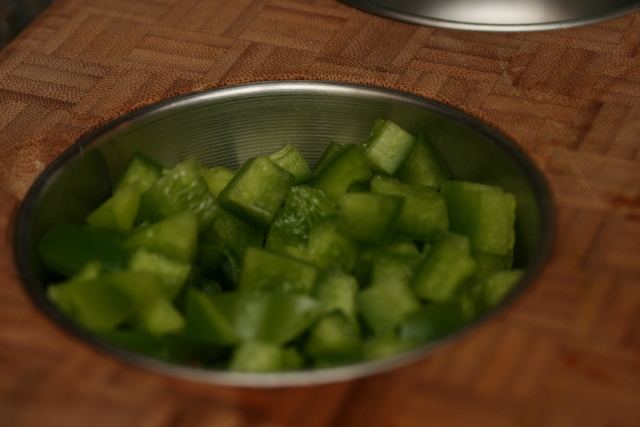 I also didn’t have any fresh celery or dill, but as you can see in the photo I was prepared to work around this. The missing chickpeas were a deal-breaker, though, so it was off to Wegmans with me. I took the opportunity to complete the first step while I ran over there, and I picked up some celery and dill while I was at it. 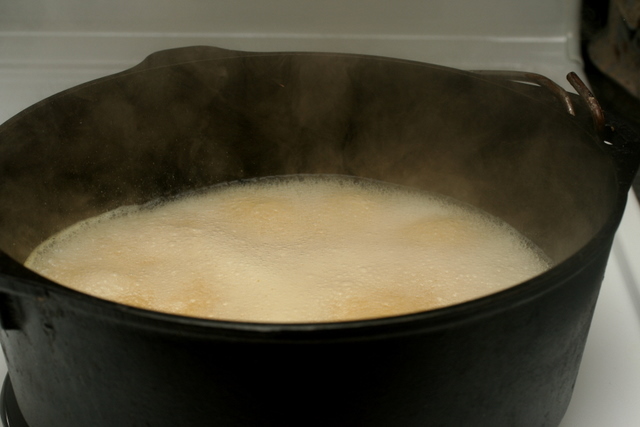 Add the remainder of the broth to the soup pot and bring to a boil. You don’t need to get this crazy with the boiling. 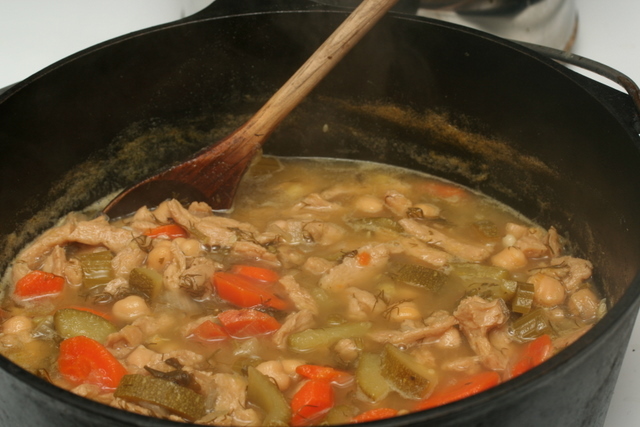 Add the Soy Curls, chickpeas, celery, carrots, onion, zucchini, salt, pepper, and cumin to the soup pot. 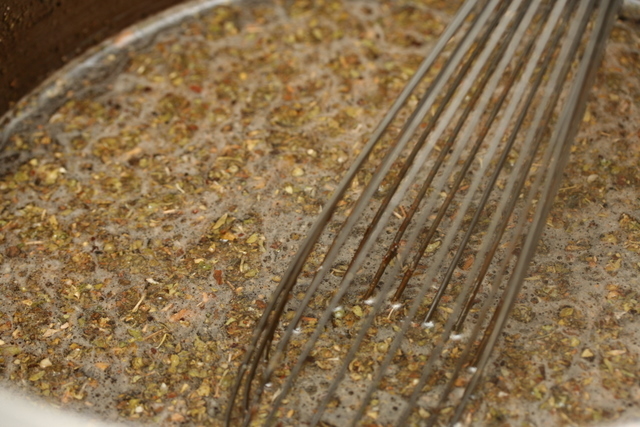 Return to a boil, then cover and reduce heat to medium low. Cook for 45 minutes. 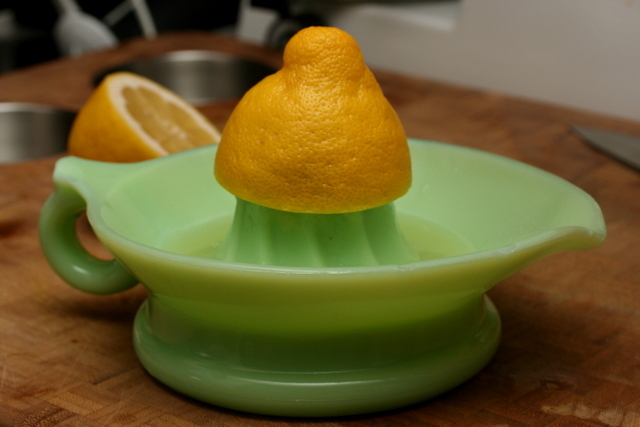 Juice the lemon. 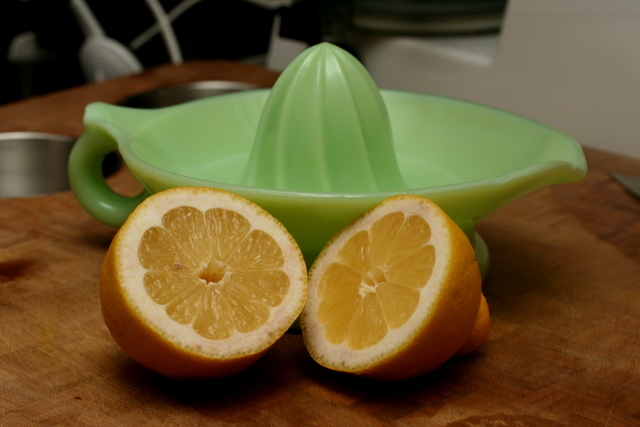 Check out my lovely Jadeite citrus reamer! I love it! If you are willing to accept a few nicks, sometimes you can find deals on this stuff. 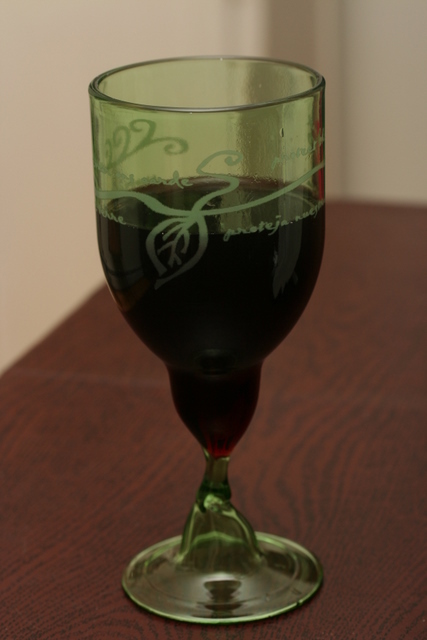 I don’t mind a couple of dings because I actually use my vintage pieces and am likely to incur a few myself anyway. In fact, it if it’s slightly defective, I’ll be less nervous about using it and I’m happy when I’m not nervous! Add the lemon juice, cilantro, and dill to the soup pot. Simmer the stew for another 20 minutes, uncovered. 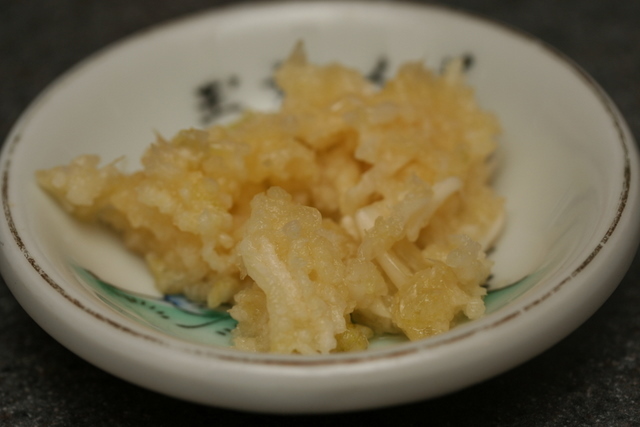 Meanwhile, prepare some rice to accompany the stew. Do NOT follow the instructions in the recipe I linked to for making rice! I was highly skeptical about it, but if any one word describes me it’s “adventurous”, so I tried it anyway. It was Not Good. I don’t know if you can tell from this picture how Not Good it was, but trust me on this. Fortunately, I am adventurous but also rife with common sense. 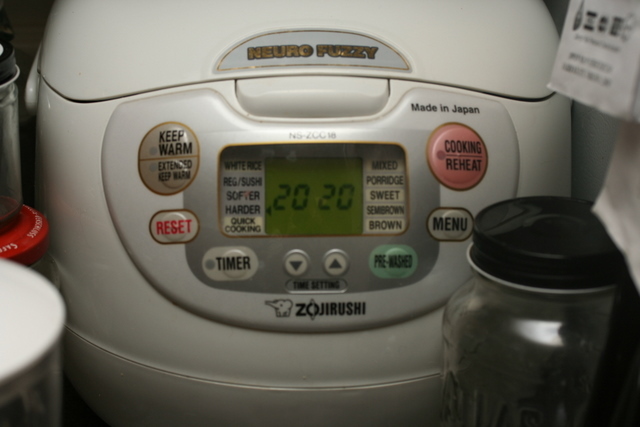 Anticipating a rice disaster, I stuck a couple of servings of rice in the rice cooker at the same time I prepared the Horrible Rice. 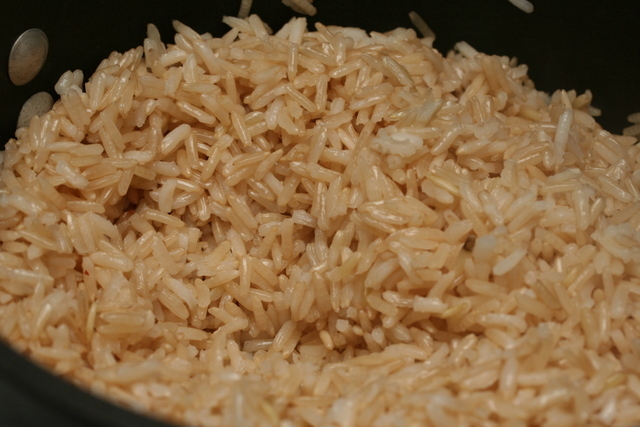 I suggest you simply make rice via your favorite method. 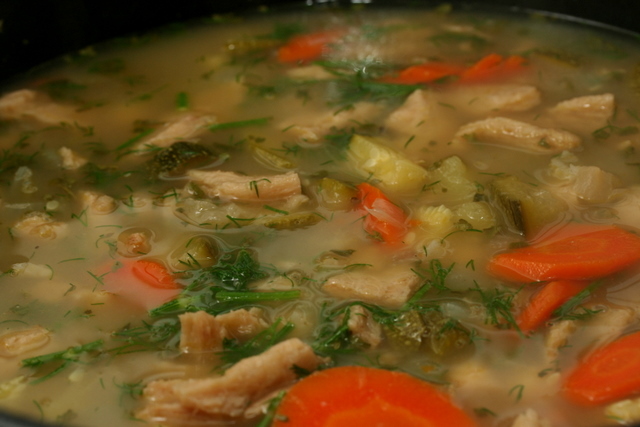 … accompanied by the kadu bouranee. Oddly, this meal (the stew, not the pumpkin) reminded me very much of one that was in heavy rotation during my childhood: Chicken Over Rice. This is odd because my diet as a kid was very American. I think my mom’s Chicken Over Rice was more a chicken-in-gravy sort of thing than a stew, but it definitely reminded me of it anyway. I think my parents would actually eat this! Mark said it was good and very filling, and I think it will make nice leftovers for lunch tomorrow, although it certainly wasn’t as spicy as I’m used to my meals being. 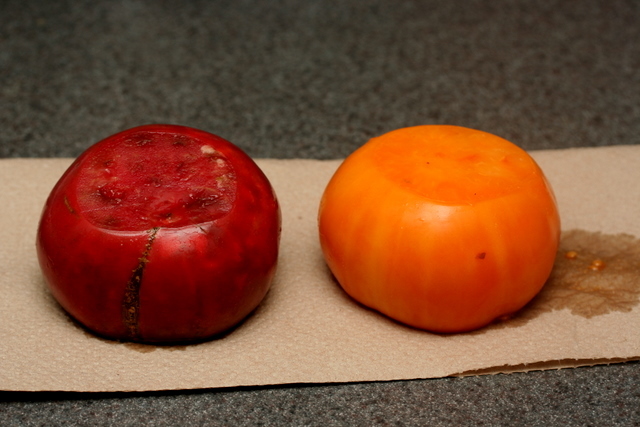 Yesterday Mark brought home two lovely tomatoes, given to him by a co-worker. I suspect they will be the last tomatoes anyone around here will be trying to get rid of! I figured I’d better do something with them before Mark made his famous Tomato Surprise, and I decided on Tomatoes à la Provençale from The Mediterranean Vegan Kitchen by Donna Klein. I strayed slightly from her recipe, mostly because I didn’t have fresh basil or parsley. What I do have is a rambling shiso plant, so I made the unlikely substitution of shiso for basil and parsley. 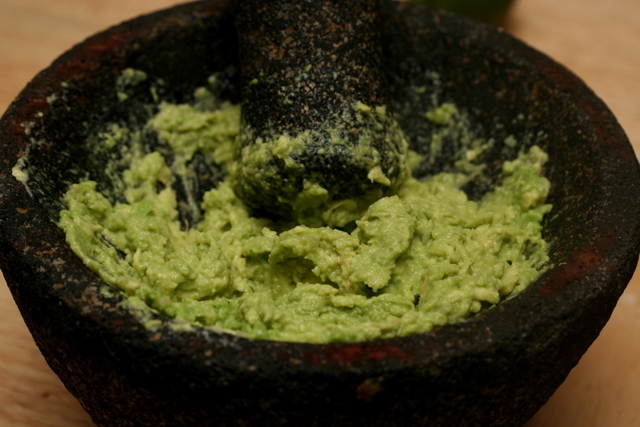 I’m guessing most of you are much more likely to have basil and parsley, so I’ll give you the original ingredients. 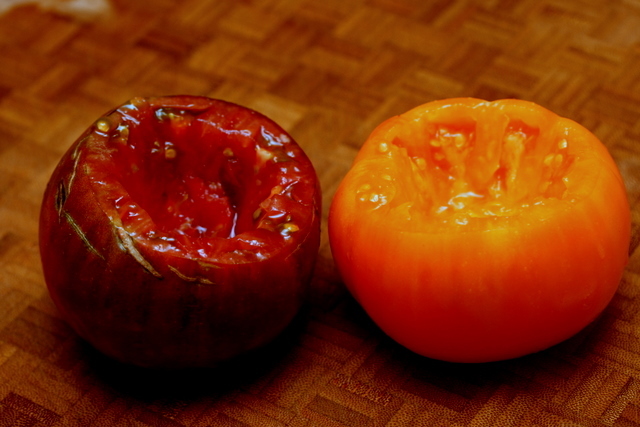 Slice off and discard 1/4 inch from the top and bottom of each tomato. 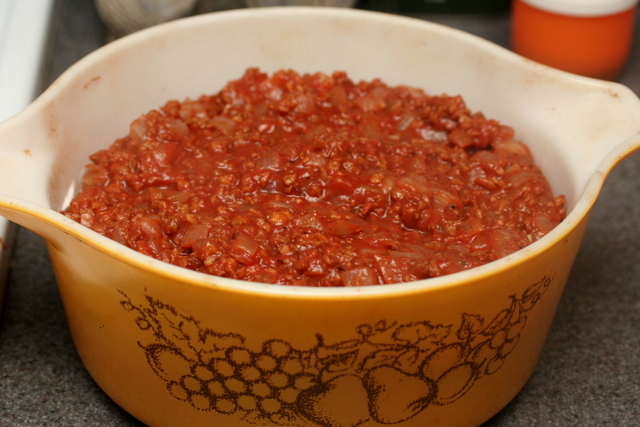 The original recipe says to then cut each tomato in half crosswise, however, the brilliant Renae, who is more accustomed to making up than following recipes, managed to miss that line and instead went right onto the next step of scooping out the seeds. 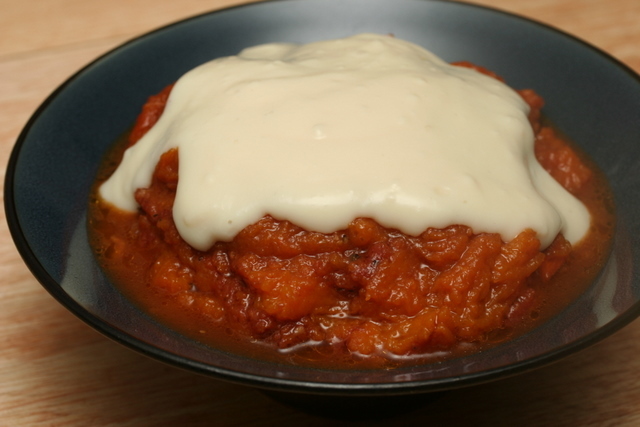 I cored each tomato, then dug out a little bit (I saved the bits other than the core for the soup I was also making). 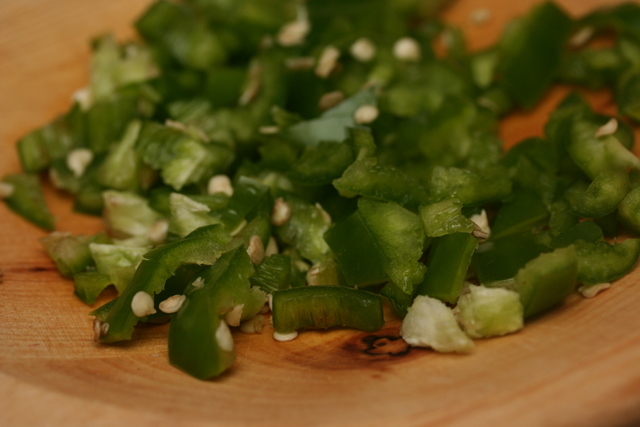 With a finger or the handle of a small spoon, scoop out the seeds. 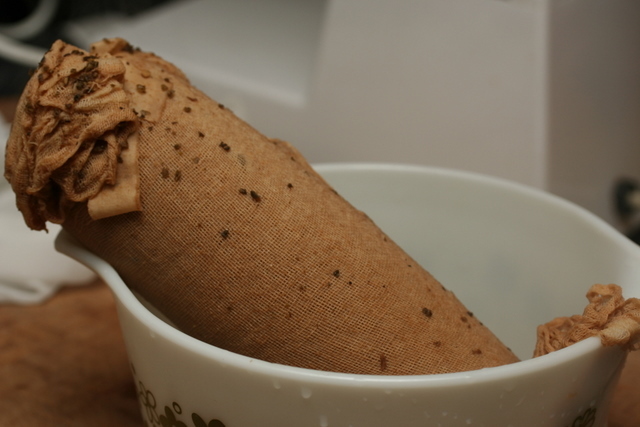 Sprinkle the insides with a little regular salt and turn them upside down to drain on paper towels for about 15 minutes. I also didn’t cut off an entire 1/4″ from the top nor especially the bottom; I just made sure they’d each sit upright. Preheat the oven to 375F (190C). Lightly oil a shallow baking dish large enough to comfortably hold the tomato halves in a single layer. Set aside. 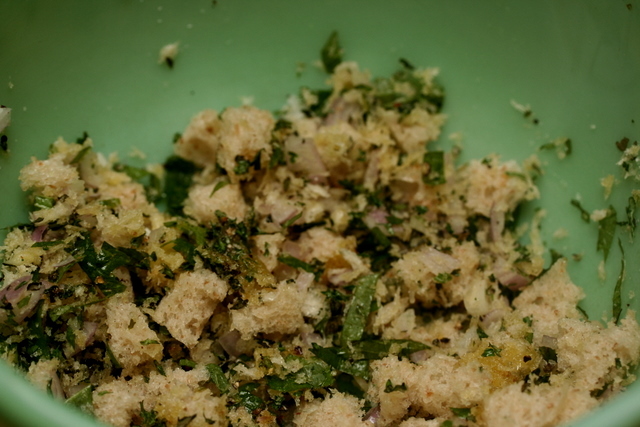 In a medium mixing bowl, stir together the dry bread crumbs, soft bread crumbs, parsley, basil, the crazy addition of shiso if so inclined, shallots, and garlic. 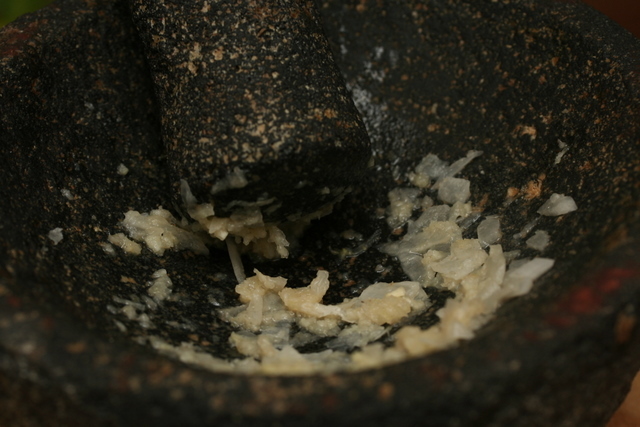 Season with coarse salt and pepper. 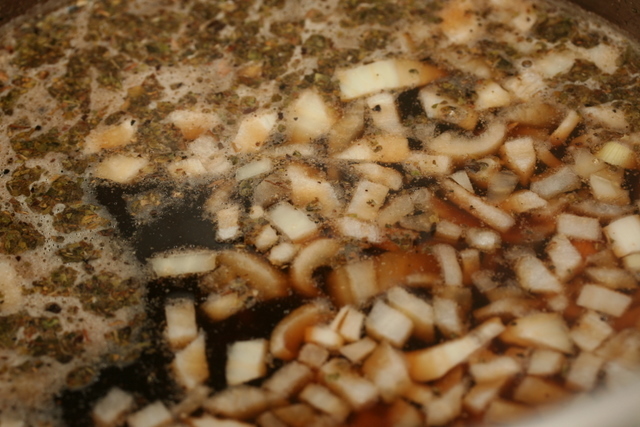 Add half of the olive oil and toss well to thoroughly combine. My sourdough slice, torn up. 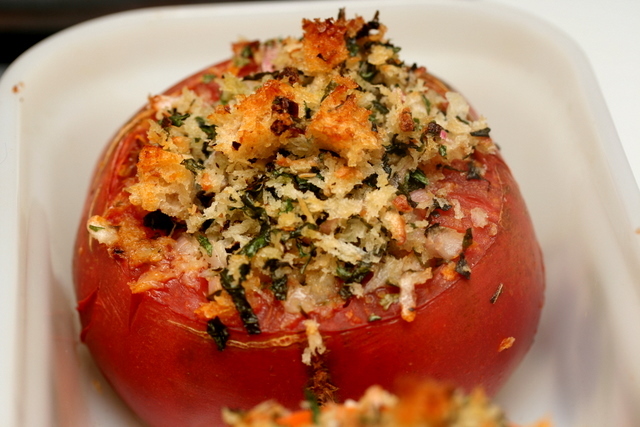 Fill each tomato half (or, if you are a dummy and can’t read directions, each whole tomato) with about 2 tablespoons of the bread crumb mixture, patting it in and letting it mound up slightly in the center. 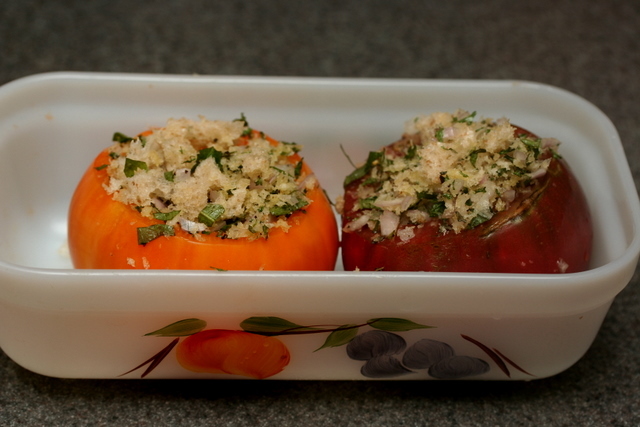 Arrange the tomato halves in the prepared baking dish. Drizzle evenly with the remaining olive oil. 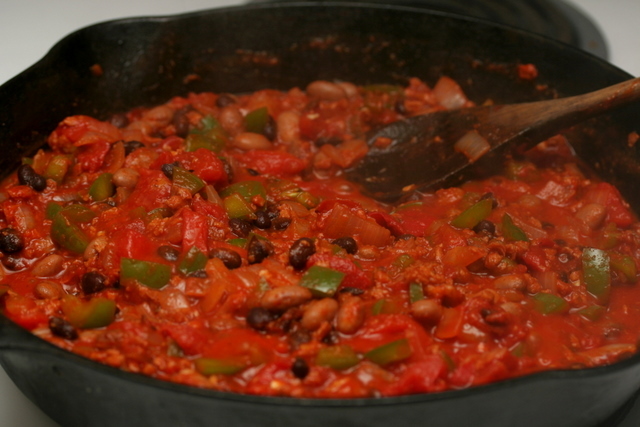 Bake in the upper third of the oven for 20 to 30 minutes, or until the tomatoes are tender but not limp or mushy. Serve warm. 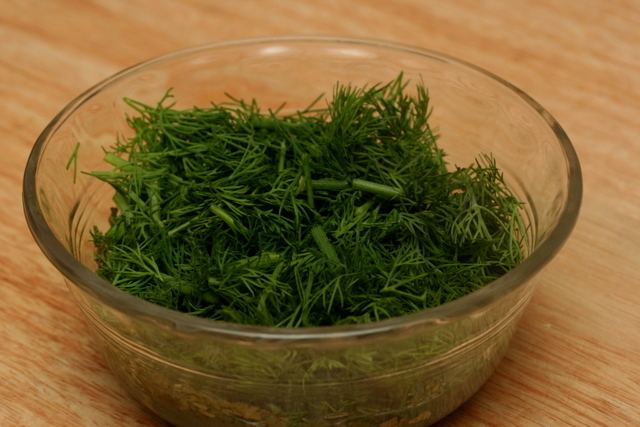 Or let cool and refrigerate, covered, for a minimum of 3 hours and serve chilled, sprinkled with the optional parsley if desired. These were good; Smark really liked his. 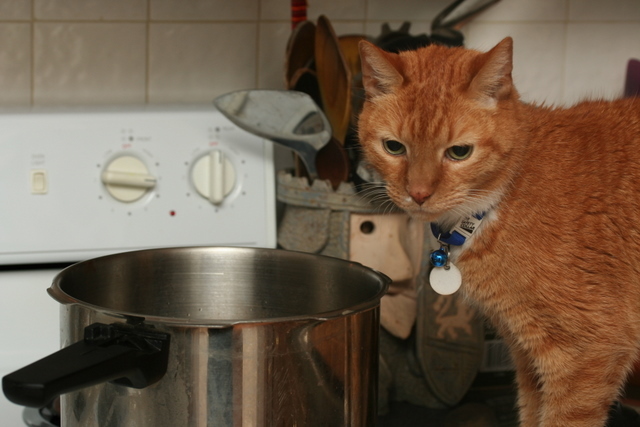 He seemed quite disappointed I didn’t make the recipe up. 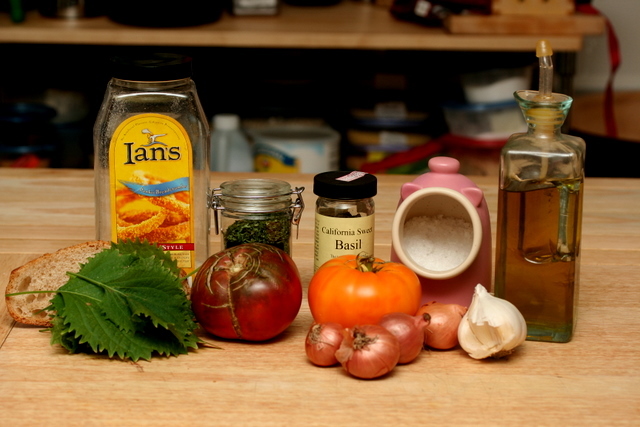 The shiso actually worked quite well, and they worked fine as whole tomatoes instead of halves. 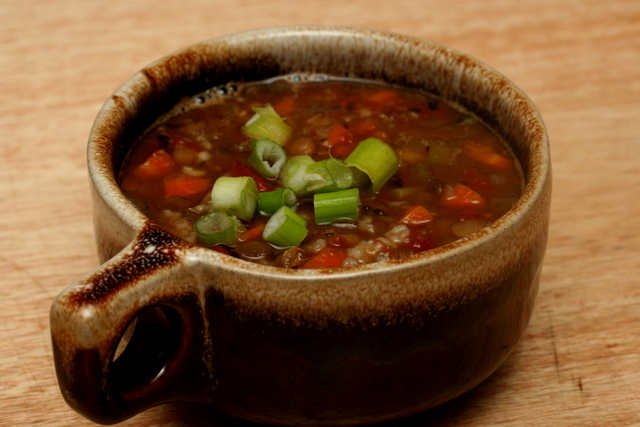 I served it with the Tomato-Lentil Soup with Brown Rice from the same book, but I’m not going to bother writing it up because honestly I liked my lentil soup better. 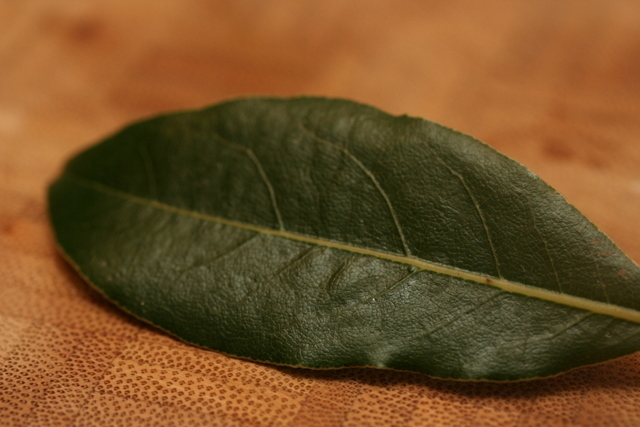 I did, however, use one of my own home-grown, fresh bay leaves for the first time, though! I’ve had the bay leaf plant for several years now, which is nothing short of amazing in terms of plant life in my hands. It’s been particularly happy now that it’s living right next to that crazy shiso plant, and is now big enough that I don’t feel bad robbing it of a leaf here and there. I don’t remember often hankering for any particular meals when I was a kid. I ate just about everything and I think I was relatively happy regardless of what my mother served on any given night, although I wasn’t very happy when she insisted on making breakfast (eggs or pancakes) for dinner. Really, the food I remember most fondly from my childhood is the salads my mom and I made just about every night in the summers, with vegetables grown in our own garden. 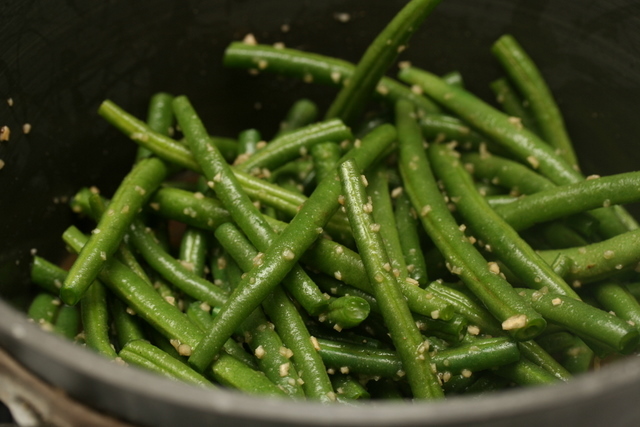 Other than the occasional brownies or cake from a mix, picking the veggies for the nightly salad was about the only “cooking” I did as a kid. 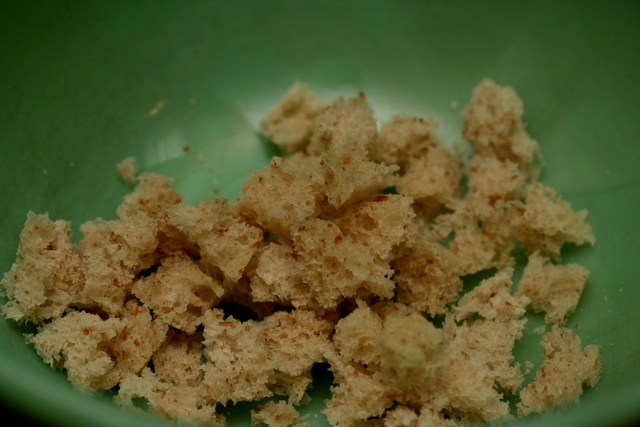 And my mom even made her own croutons, can you believe that?! Anyway, apart from salads, although I remember particularly liking special-occasion meals like baked ham and roast beef, I don’t remember ever requesting my mother make any particular meals…except once, when I remember asking for “that noodle stuff with the meat and cheese” for my birthday dinner. 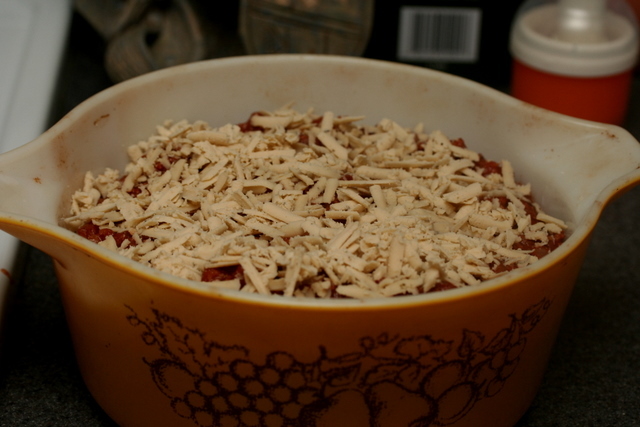 When I went through her recipes this weekend, I discovered it is called Hamburger Noodle Bake and it was my great-aunt’s recipe, and although Mom didn’t make it all that often, I guess it made a big impression on me because I’ve never forgotten it (unlike the alleged pork chops). As more and more years have passed since I became vegetarian (more than 20 now), I’ve forgotten what the dish really tasted like, but I have never forgotten liking it. At long last, the memory is restored! 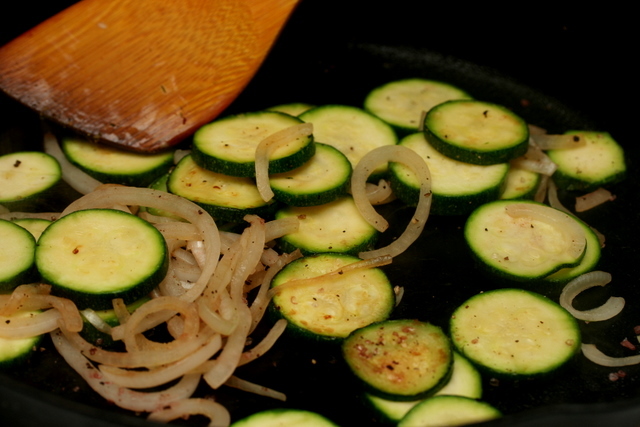 Melt fat in skillet. Put in hamburger and brown. 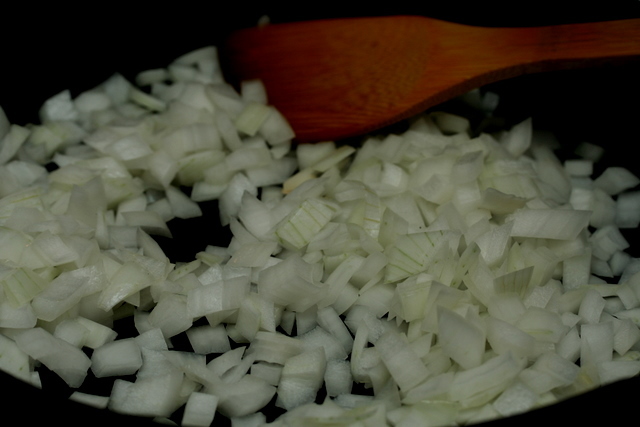 Add onion, salt, pepper, sugar, and tomato sauce and cover; cook 15-20 minutes. Cook noodles according to pkg. 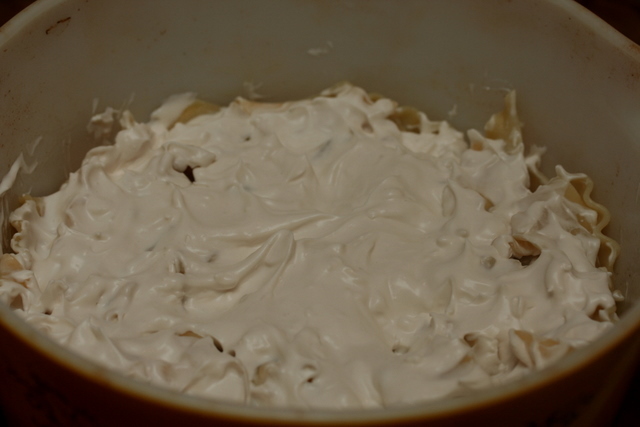 Combine cream cheese and sour cream together and add in layers starting with noodles, cream cheese mix, and meat Cover with cheddar cheese. Bake 20 minutes at 350 degrees. Preheat oven to 350 degrees Fahrenheit. 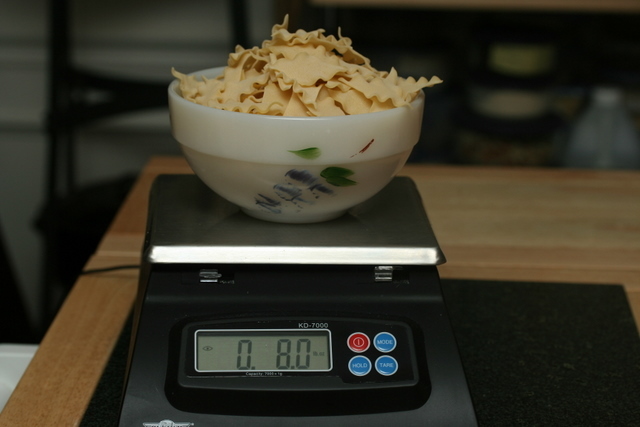 Weigh noodles. I usually never scale pasta and just guess at serving sizes, and I always vastly over-estimate. So tonight I scaled it! 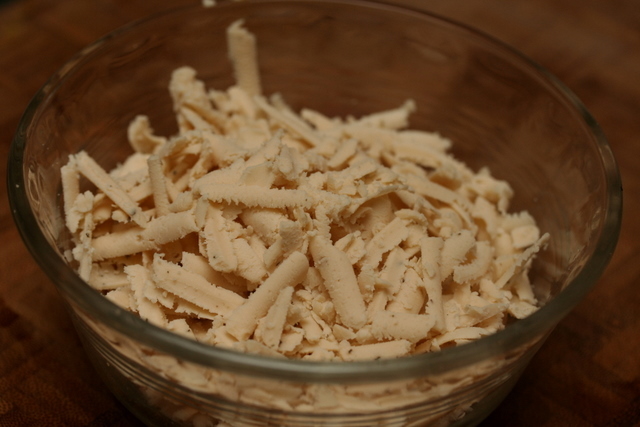 Cook the pasta al dente and drain. 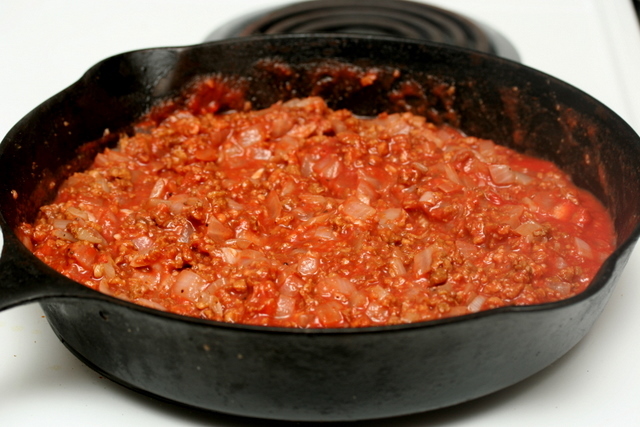 Meanwhile, bring a large skillet up to medium heat and then add a bit of oil. 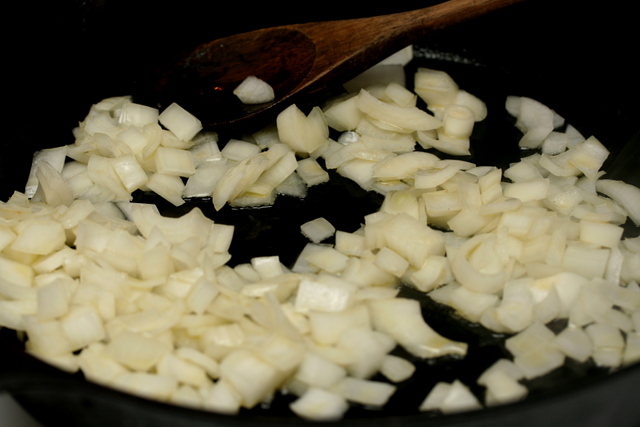 When oil is warm, add the onions and saute until translucent. 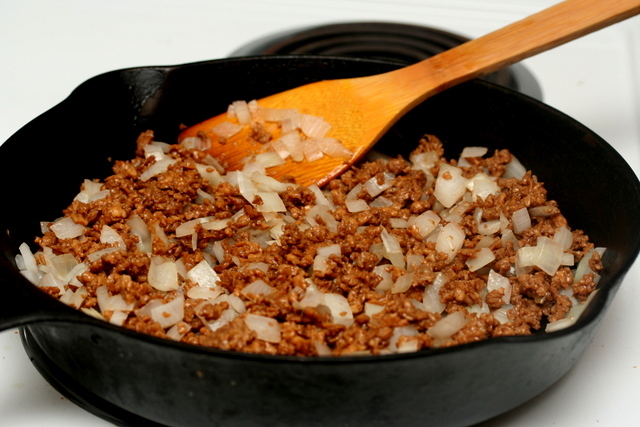 Add the “ground beef” and cook for 5 minutes. Next I added garlic because I found it inconceivable it wasn’t called for, but that’s just me. 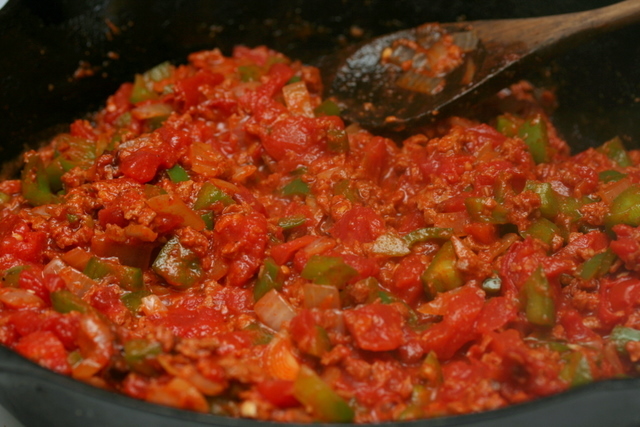 Add the tomato sauce, salt, pepper, and sugar or stevia if using and stir to mix. Cover and cook for 10 minutes. 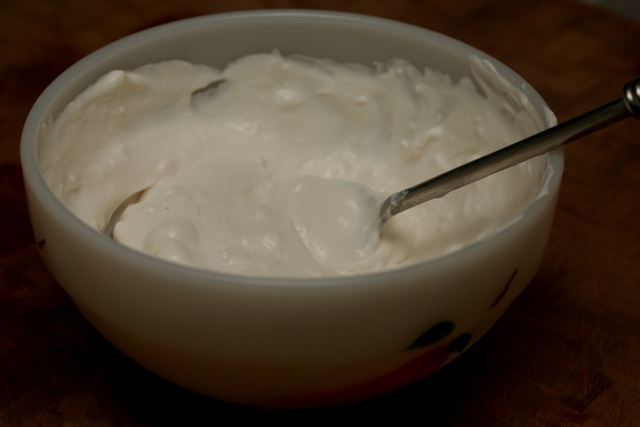 Meanwhile, combine the cream cheese and sour cream in a small bowl. 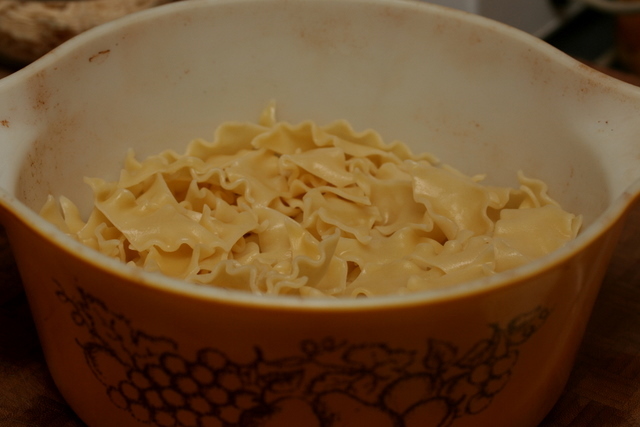 Place the noodles into a casserole dish. I sprayed it lightly with olive oil so they wouldn’t stick. 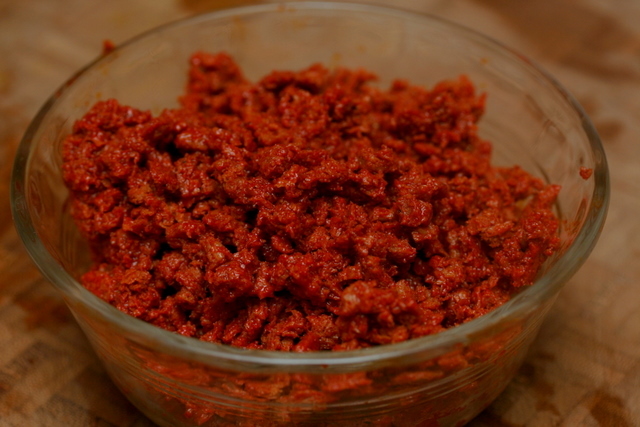 … then top with the “meat” and sauce mixture. Top with the “cheddar cheese”. Serve with a tossed salad (I do wish for those halcyon days of having a garden that grew an entire salad!) or plenty of veggies. Mark, who is on a big health kick, has a habit of asking me if everything I make is “bad for you”. As a general rule, very few things I make are actually downright bad for you, and he actually asks this question of things like steamed broccoli, so the answer he generally gets is, “Are you insane?” His question was a bit more relevant than usual in regards to this meal, because it was made with several processed and convenience foods, which I generally like to avoid or use sparingly. 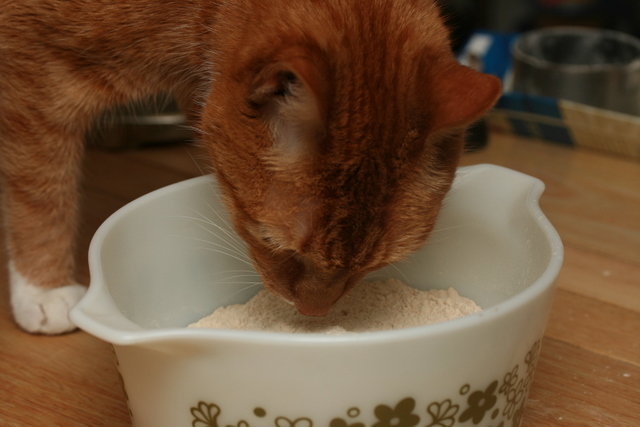 So I told him it wasn’t as great for him as most meals I make, although probably better than the original. 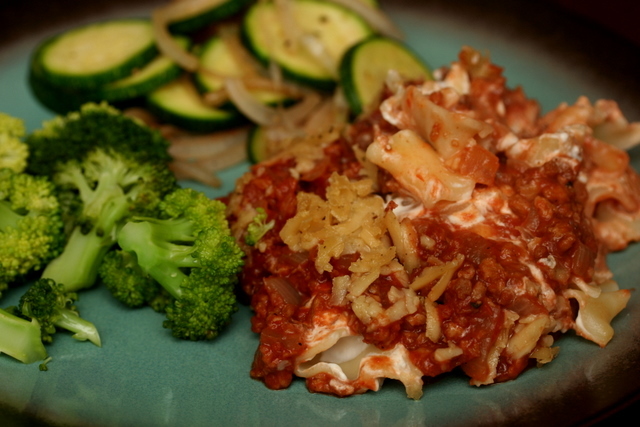 However, I wanted to know what this meal from my memory banks really tasted like, and making it with Tofutti products and commercial vegan “ground beef” was the closest I was going to get to that – and it worked: it tasted right. But as I was pulling it together, my mind was already churning with ways to healthify it – or in other words, in typical Renae fashion, make it much more difficult than it needs to be – and sophistify it. 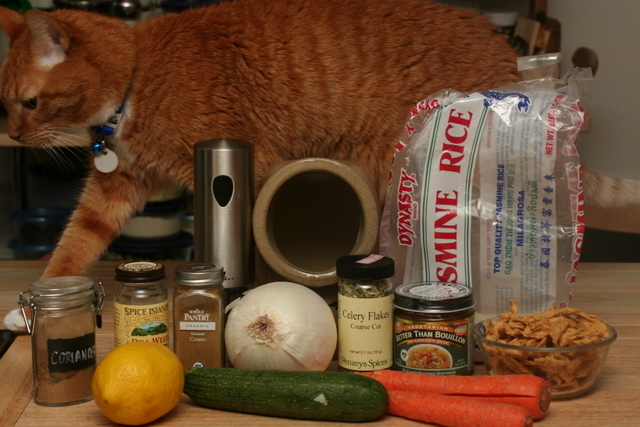 I’m thinking bulgur instead of “beef”, cashew and/or tofu cream for the “cheese”, and whole wheat noodles. And I felt the tomato sauce was just calling for wine. 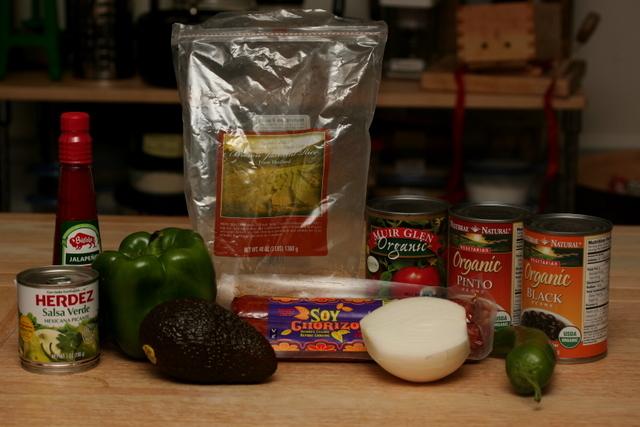 It is my plan, therefore, to repeat this meal, using whole foods. I think it will be a fun experiment. This meal also reminded me of one I was served more frequently as a child: Hamburger Helper. This is one of the recipes I got from my mother’s recipe box that I don’t remember her ever making. It was in my aunt’s handwriting, so I suspect my aunt made it for us at one time and we liked it, so she gave my mom the recipe. But speculation is all I have on this one. I won’t bother typing out the original because really the only substitution I made was vegan Parmesan for the real thing. 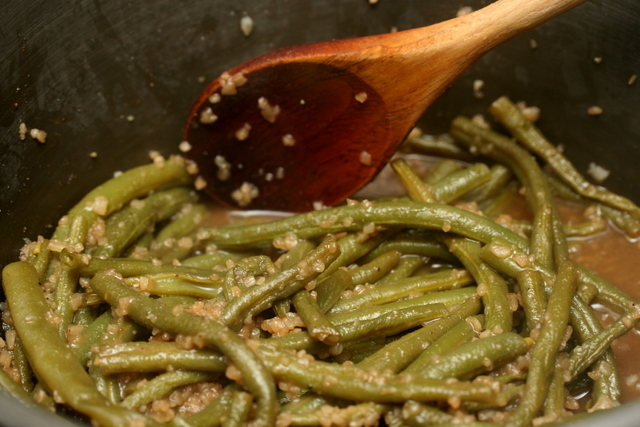 Place the green beans, water, and soup mix in a medium sized pot. 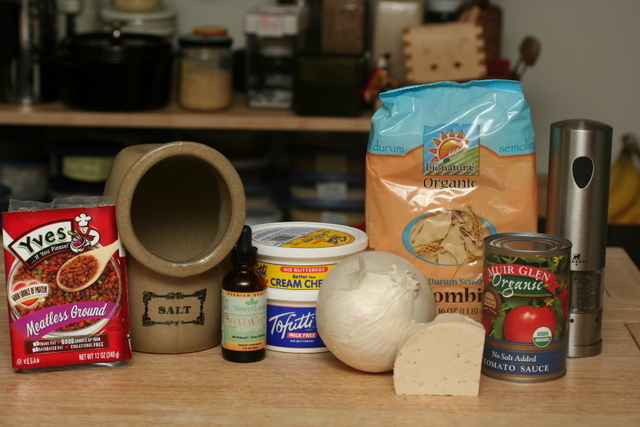 Because all I could find at Whole Foods was French onion dip mix and not onion soup mix, I also included a teaspoon of “beef” bouillon. 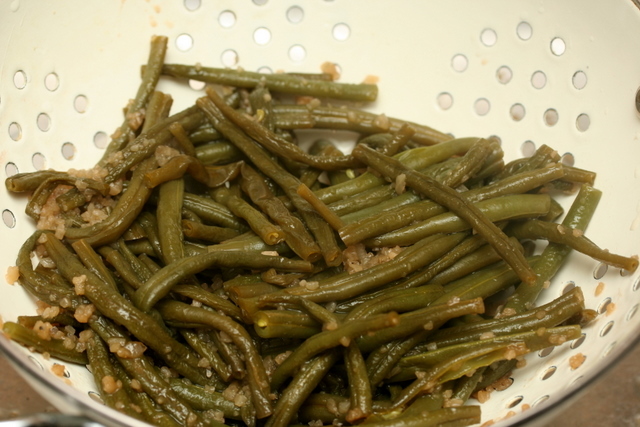 Cover and cook over medium low heat for 20 to 30 minutes or until green beans are tender. 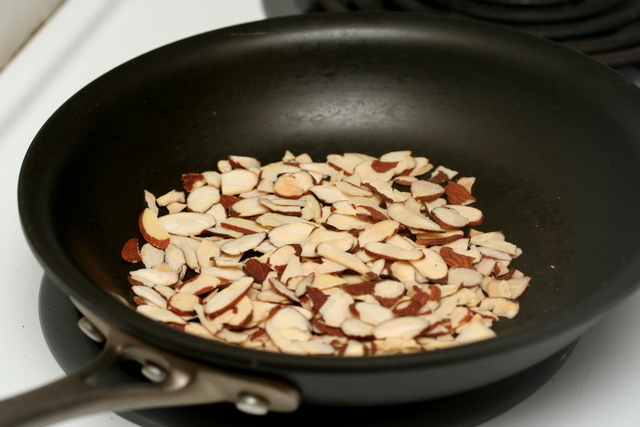 Meanwhile, toast the almond slivers over medium heat. This should take about 3 to 5 minutes. 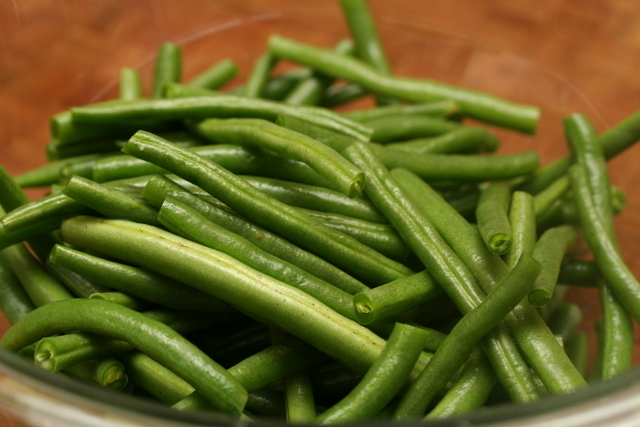 When the green beans are ready, drain. 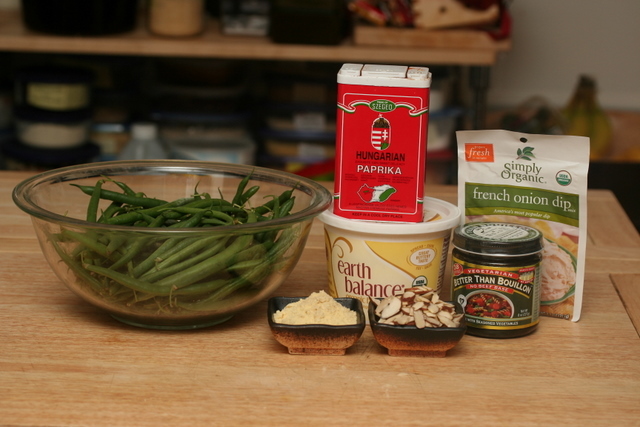 Place green beans in a serving dish (I just returned them to the pot since it was just me and Mark), then toss with the margarine, almonds, and “Parmesan”. 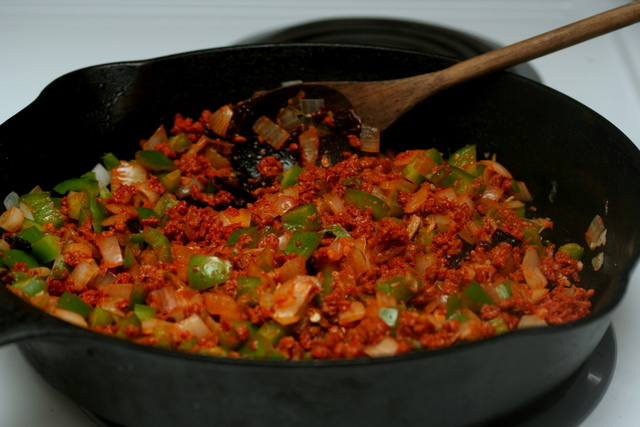 Top with paprika. The green beans weren’t actually in focus in any of the pictures I took of the plated meal last night, so I don’t have a presentation photo for you. Mark really liked these; he ate two rather large servings. 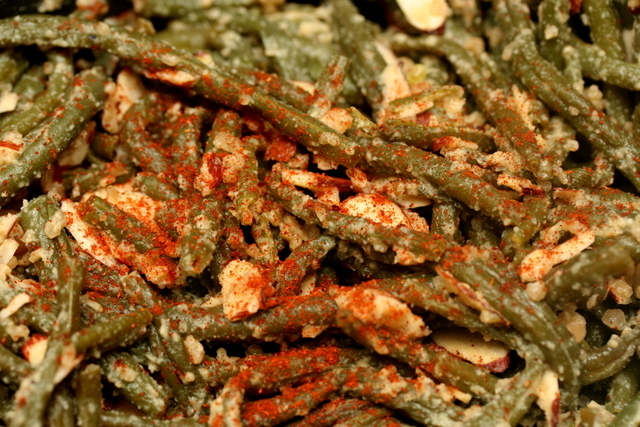 I tasted a green bean before adding the “cheese” and actually liked it better than I did after adding the “cheese”, but after a few bites, it grew on me. By the way, Mark reports that last night’s baked ham was really good on a sandwich today, in fact, he had a sandwich for breakfast and then requested one for dinner. 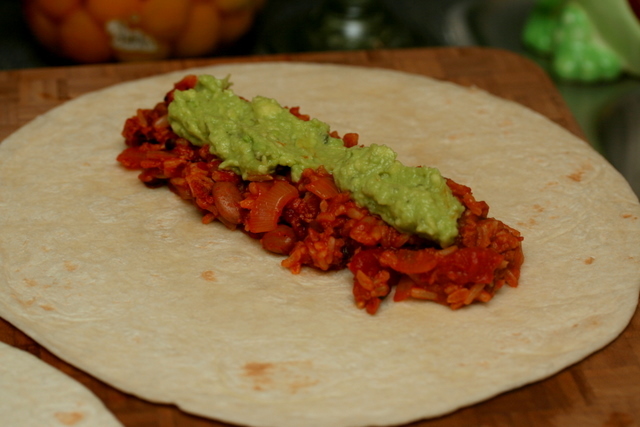 I had already started on veganizing another old recipe for dinner, however, so stay tuned tomorrow for another episode of My Family Recipes! Mark and I visited the parental homestead, that is, my parents’ house, this weekend. 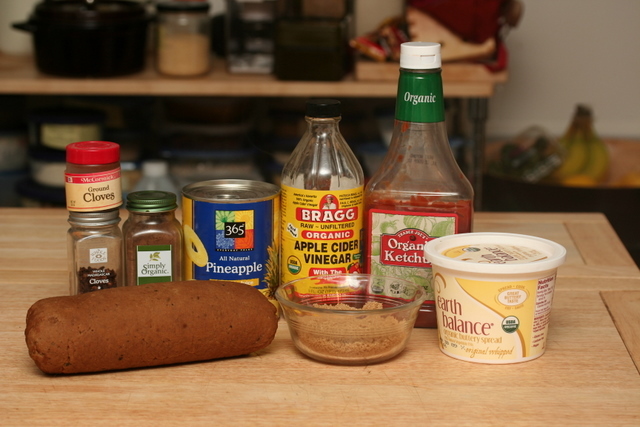 While I was there I photographed a bunch of recipes from my mother’s little-used recipe box, with hopes of veganizing a few old favorites. My mother doesn’t cook, so this isn’t a very big undertaking. * Many of the recipes I grabbed are things I’m sure my mother never actually made, either. Anyway, one of my favorite meals as a kid was baked ham, which my mother and my grandmother used to make topped with pineapples. 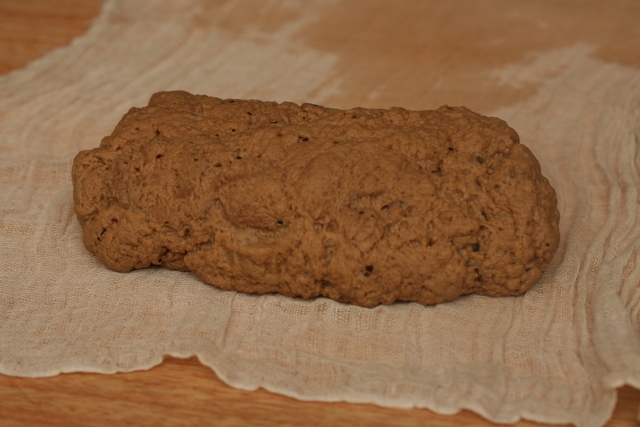 I reinvented this as baked seitan today. 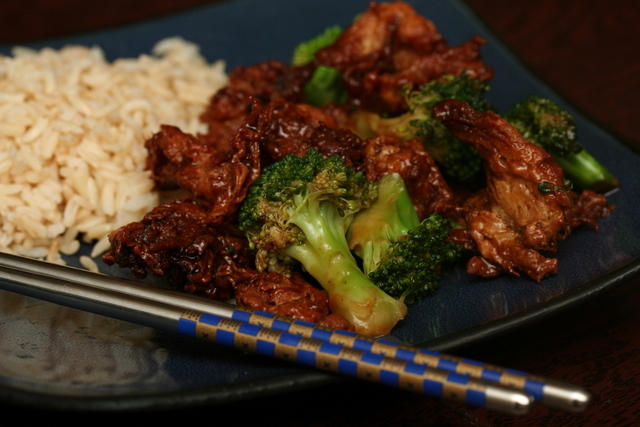 It turned out fairly well, although the seitan – the UnHam from Simply Heavenly! 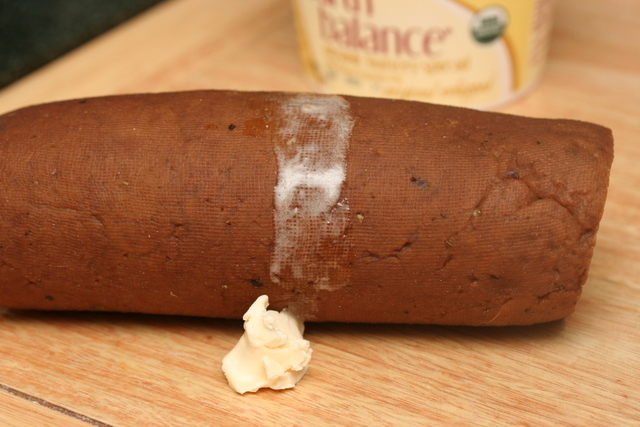 – wasn’t very “hammy” and I plan to play around with the seitan in the future. I’ll give you the recipe I used tonight in the meantime, though. 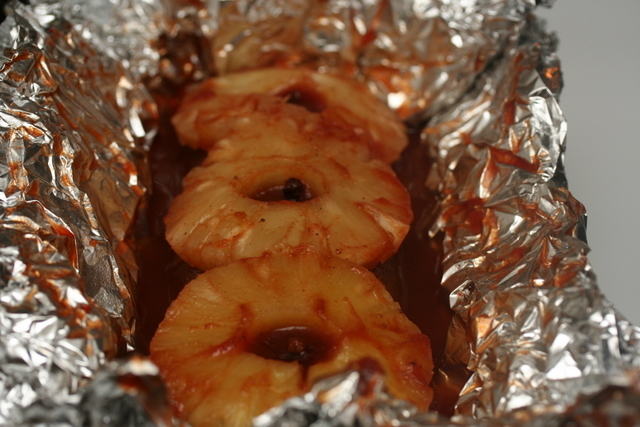 First, here is the original version of the Pineapple-Glazed Baked Ham. 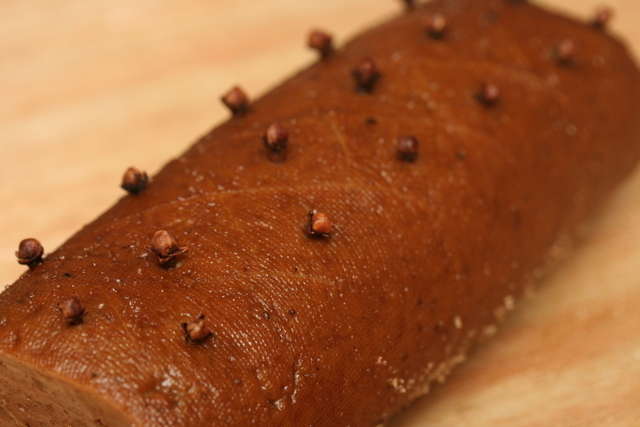 I talked to my mother about this recipe and she’s not sure where it originally came from and doesn’t specifically remember it being my grandmother’s, however, I am quite sure my grandmother made ham like this. My mother actually uses this recipe as well, on those extremely rare instances she takes it upon herself to bake a ham. She says the recipe may be hers, but I’ve never known my mother to invent a recipe on her own. But maybe she did! Preheat the oven to 300 degrees Fahrenheit. 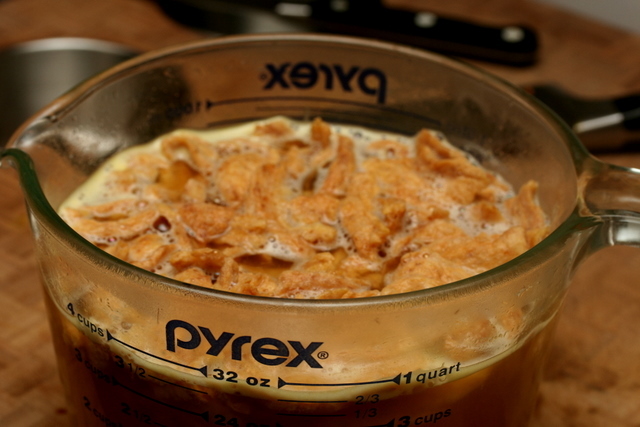 Remove 1 Tbsp of the brown sugar and set aside. 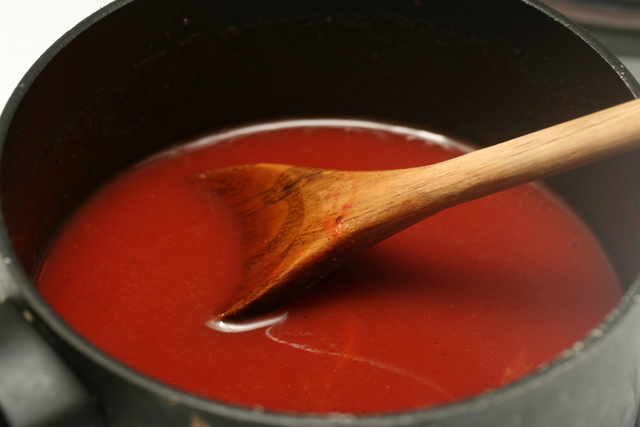 Place catsup, vinegar, water, ground cloves, allspice, and remaining brown sugar into a small, heavy saucepan and heat over medium heat until bubbly, then reduce heat and simmer for 5 minutes. 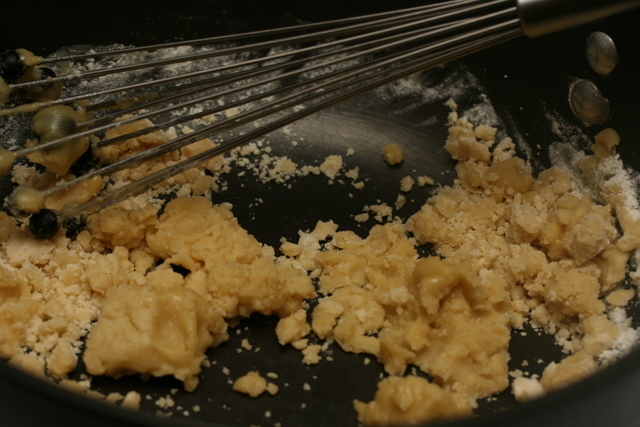 … then rub with the reserved tablespoon of brown sugar. 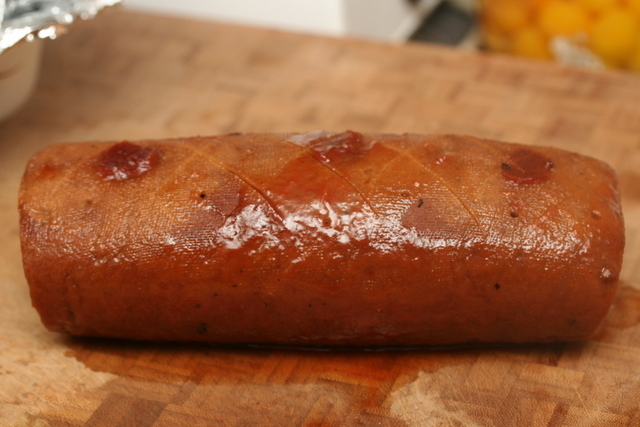 Score the seitan perpendicularly into diagonals, then stick a whole clove in the middle of each diamond. 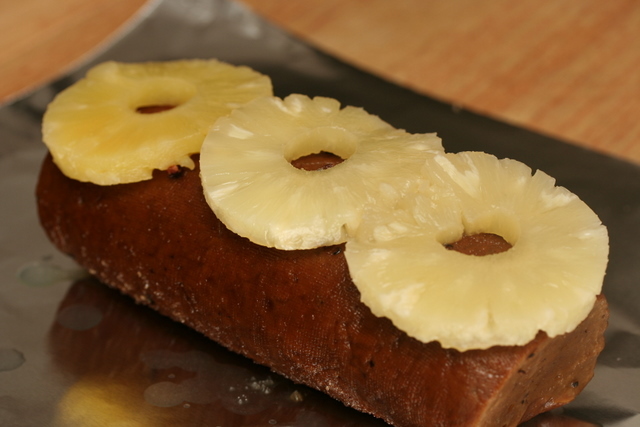 Place the seitan onto a piece of aluminum foil that is large enough to completely cover it, and place the pineapple rings on top of the seitan. 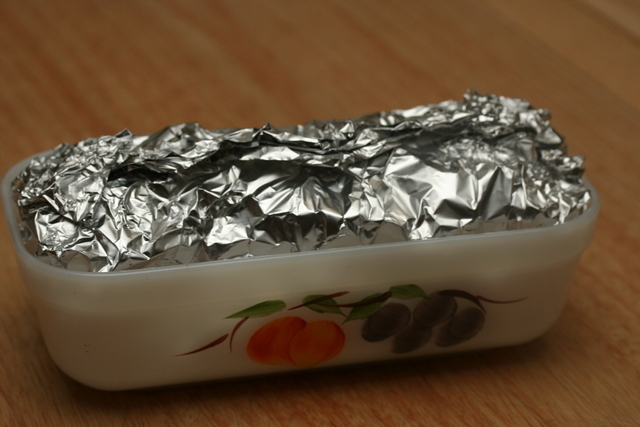 … and close the foil up. Place in the oven and bake for 30 minutes. 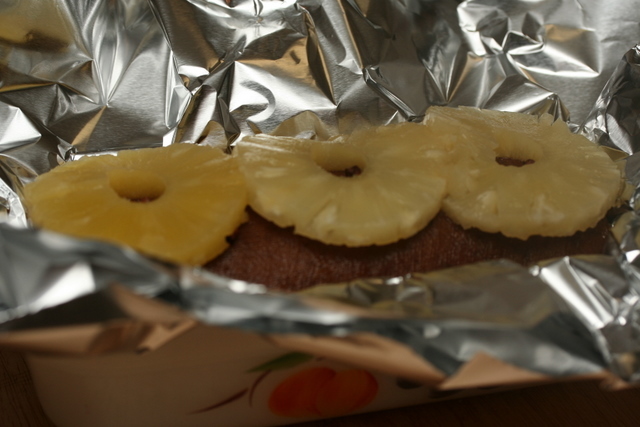 After 30 minutes, remove and open the foil up, then continue baking another 30 minutes. 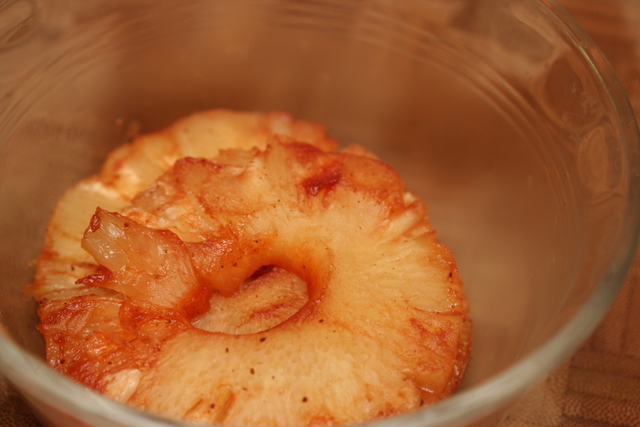 Remove and reserve the pineapple rings. 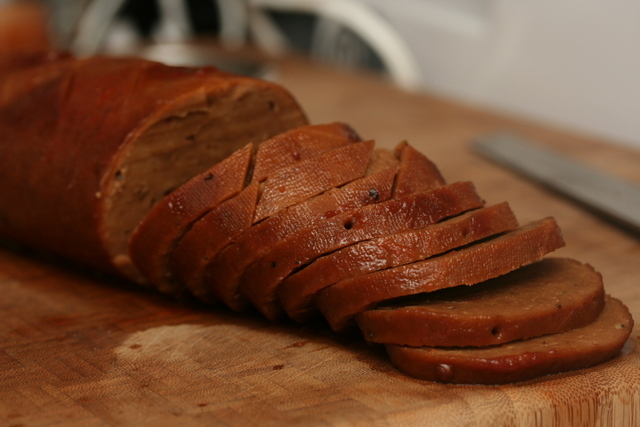 Slice the seitan as you would ham. 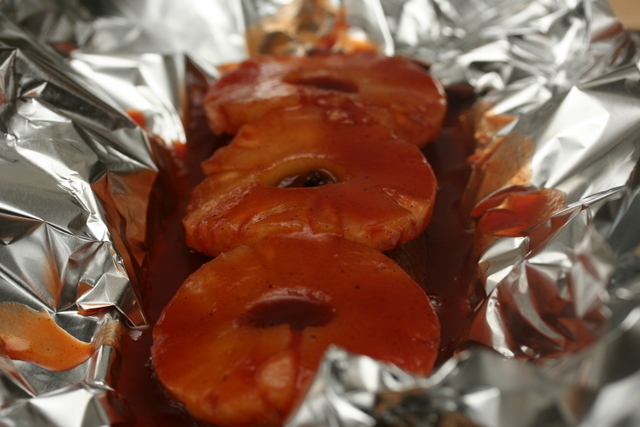 Serve, topping with the leftover basting sauce if desired, with pineapple rings on the side. The verdict on this was somewhat mixed. 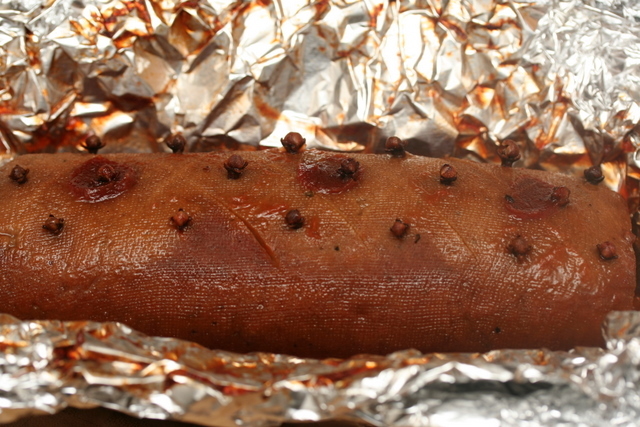 As a “baked seitan”, it was successful, however, as “ham”, a bit less so. It tasted like seitan, not ham. I’m not sure how much I really want to mimic the flavor of ham – very real-tasting fake meat freaks me out – but I think I can come up with something more hammy than this. 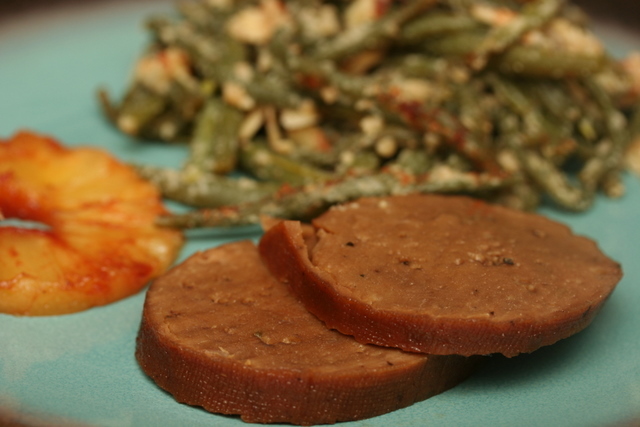 That said, all of the “un-meat” seitan recipes I’ve made from Simply Heavenly! are good and this was no exception. Mark said he really liked “the presentation”, and since this was my favorite meal when I was young, I liked it very much myself. Therefore I plan to make the “ham” taste a little more authentic in the future. 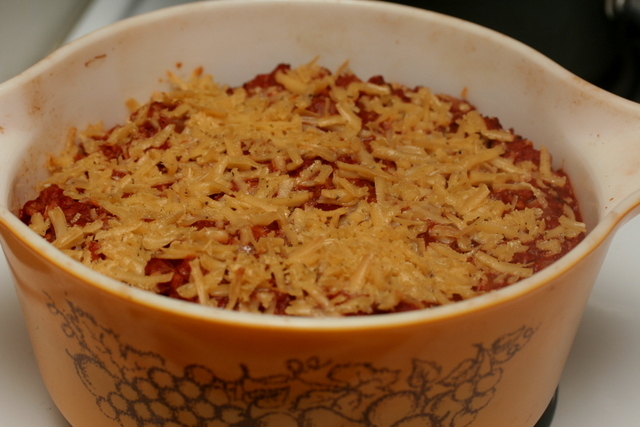 If you go in having no hopes of ham, the following recipe is great! 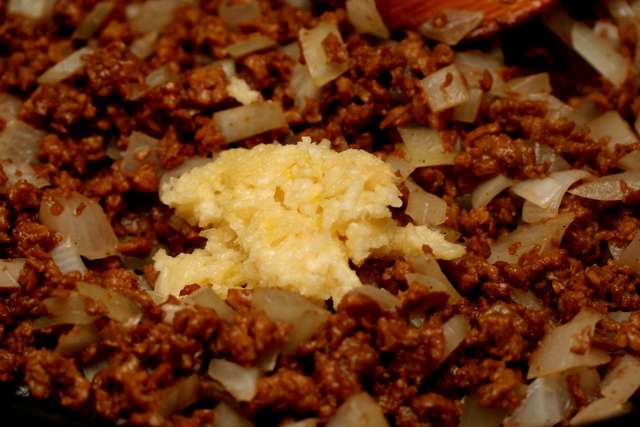 Whisk together all ingredients except the vital wheat gluten and the chopped onions in a pressure cooker. 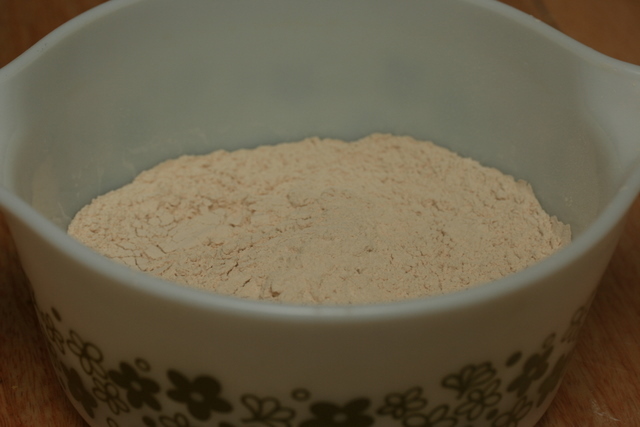 Place the vital wheat gluten into a medium bowl. 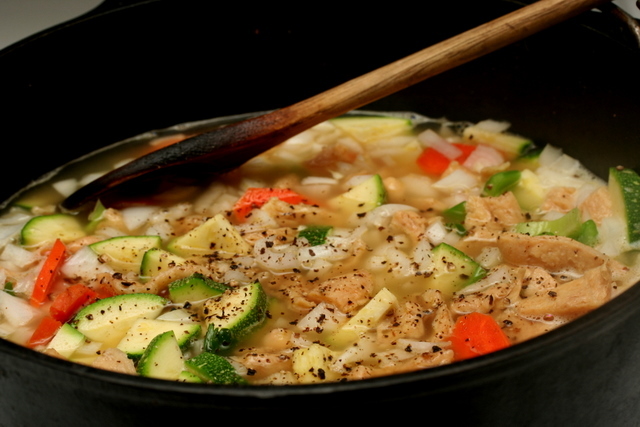 Remove 2 cups of the liquid from the pressure cooker and mix with the vital wheat gluten,. I just use my hands. 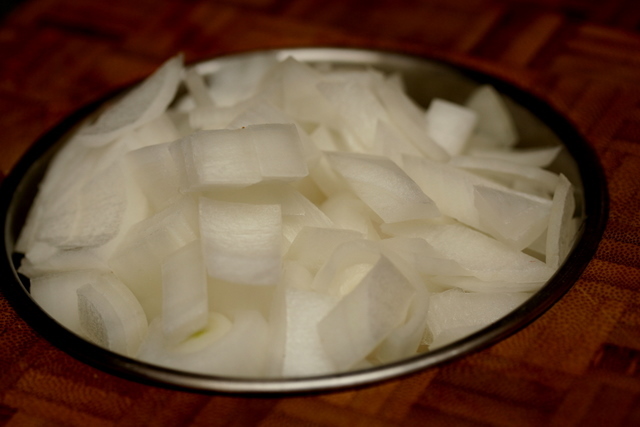 Add the onions and an additional 4 cups of water to the pressure cooker and set over medium high heat on the stove. 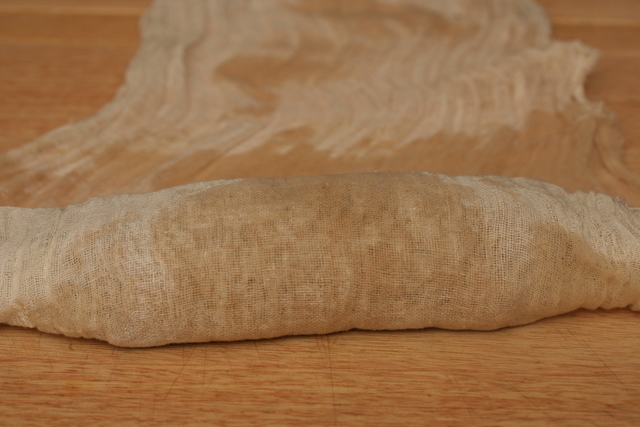 Meanwhile, form the seitan into a log shape and wrap tightly in cheesecloth. 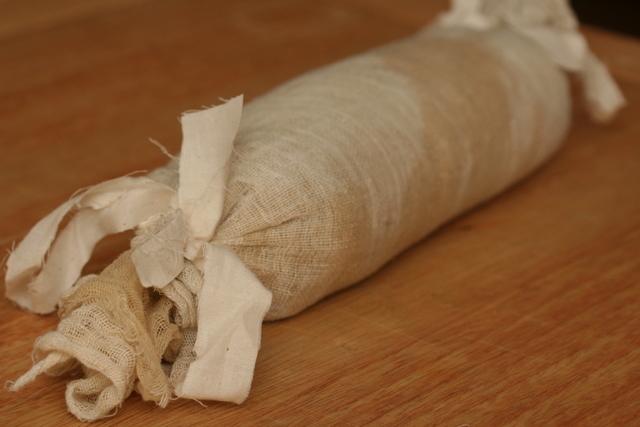 I didn’t have any kitchen twine, so I ripped two long, thin lengths of muslin and used those to tie the ends like a Tootsie roll. 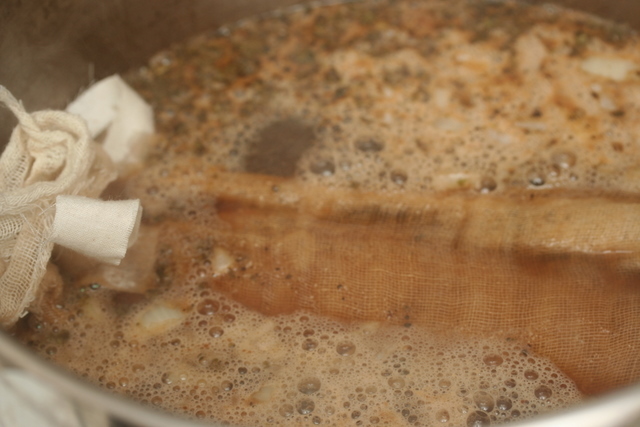 Place the wrapped “log” into the broth in the pressure cooker. I didn’t even realize what Tigger was doing until after snapping this picture. 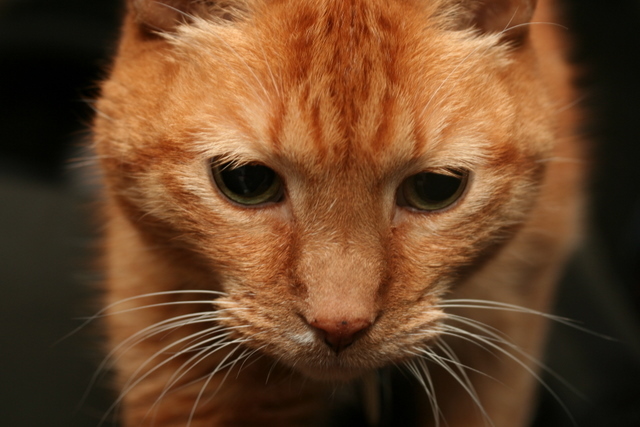 Don’t let your cats do this. 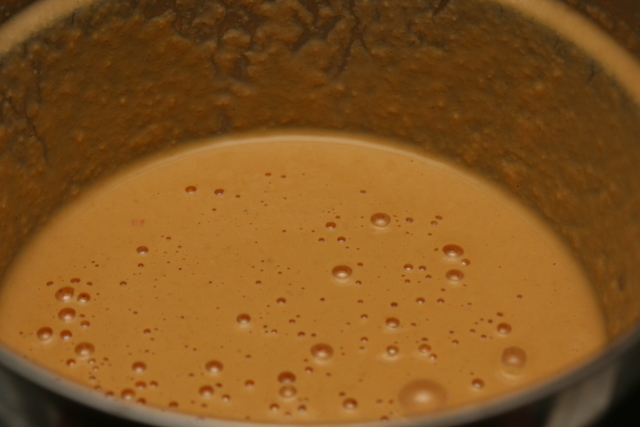 Put the lid on the pressure cooker and bring up to pressure, then reduce heat to medium-low and cook for 35 minutes. Run under cold water to bring pressure down quickly. 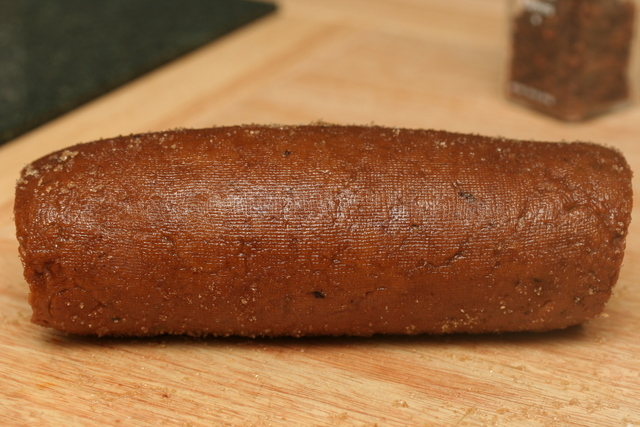 Remove seitan from cooker and allow to cool a little bit, then unwrap. 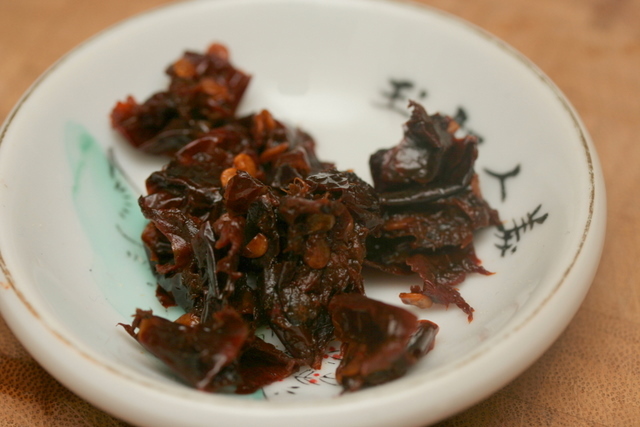 For lunch tomorrow, I intend to make a sandwich using several slices and some hot sauce my friend made using brown sugar that I think will go very well with the “unham”. And finally, I’m sorry but I absolutely can not resist posting this picture. * By the statement that my mother does not cook, I do not mean to imply that we didn’t have a hot meal for dinner every night when I was growing up, because we did, and it was very rarely take-out from the sub shop, nor did we go to restaurants. It even regularly involved what I would term “cooking”.